There are thought to be more sheep breeds in the UK than any other country in the world. 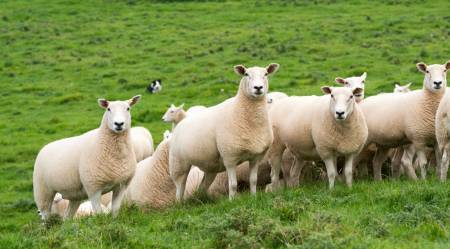 The breeds listed here enjoy affiliation to the National Sheep Association. 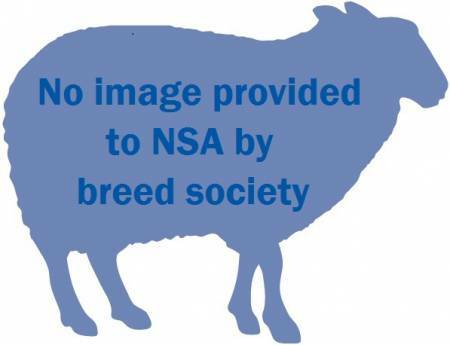 For more information about NSA breed society affiliation email [email protected]. Appearance: There are two types of Badger Face Welsh Mountain sheep – Torddu and Torwen. Torddu are mainly white with a black underbelly and black stripes around eyes. Torwen are mainly black with a white underbelly and smaller white eye stripes. The Torddu type is three times more common than Torwen. History: The Badger Face Welsh Mountain is believed to be one of the oldest British sheep breeds, with origins dating back to the 1st century. It was further developed in the Middle Ages, where the cloth trade called for flock masters to select more for white fleece. The Badger Face Welsh Mountain Sheep Society was established in 1976. Geography: The breed originated in the hills and mountains of Wales. It is now known that many breeds around the world carry the badger face gene. Breed attributes: Badger Face Welsh Mountain sheep are very hardy so can survive in harsh conditions. The society promotes the females as having a strong mothering ability and their lambs as fast growing. 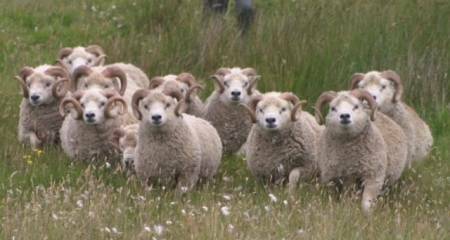 Commercial desirability: They are suited to both upland and lowland conditions, with a good lambing percentage in upland conditions (160%). Appearance: Balwen is the Welsh word for ‘white blaze’. These sheep are usually black, brown or dark grey in appearance with a white stripe from the top of the head to the nose, a white tail and four white socks. Males are typically horned. History: The Balwen Welsh Mountain was first established in the UK in the 19th century by a group of enthusiastic breeders. A breed society was formed in 1985 following an increase in numbers after the breed was almost wiped out by the harsh winter of 1946-47. 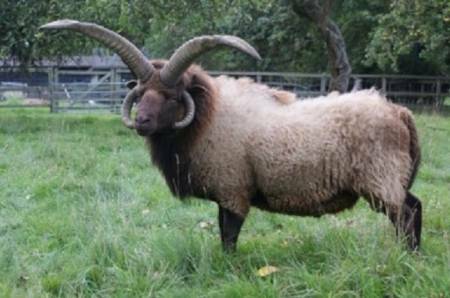 Only one ram survived at that time, taking the breed to near-extinction. Geography: The breed originated in the Tywi Valley in Central Wales, with interest growing outside the valley from the 1970s. It is recognised as a rare breed by the Rare Breeds Survival Trust. Breed attributes: Balwen’s are a maternal hill breed, so the females are small and very hardy with a strong mothering ability. This allows them to rear lambs in difficult environments. Commercial desirability: The Balwen Welsh Mountain Sheep Society promotes the breed as having few health problems and requiring minimum supplementary feeding at peak times of the year. 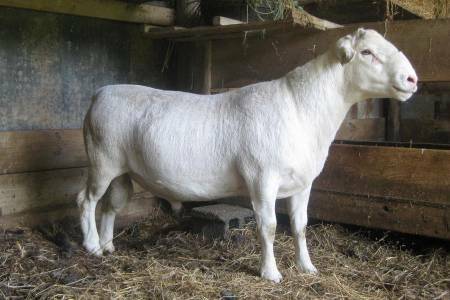 Appearance: The Beltex has a white face, long body and medium white fleece. 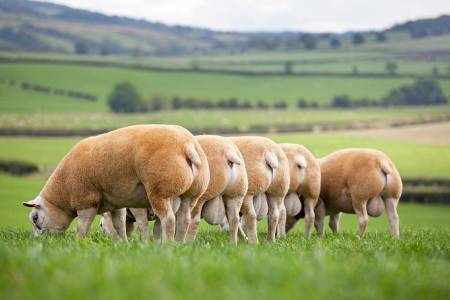 It is renowned for its double-muscled hindquarters, which makes it appear ‘wedge-shaped’ with narrow shoulders becoming wider towards the back of the sheep. History: The breed was introduced to the UK in 1989, with the Beltex Sheep Society formed soon after in 1991. Geography: Beltex sheep originated in Belgium and were developed from the Texel breed. The name is an abbreviation of Belgian Texel. Breed attributes: The breed is best known for its extreme conformation. 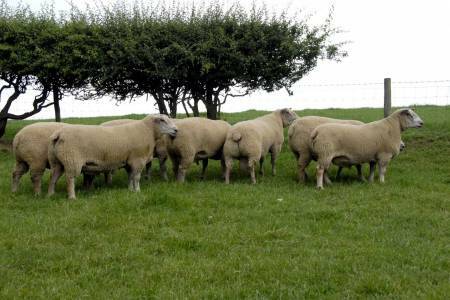 It is a lowland, terminal sire breed used to produce lambs with increased meat yield. 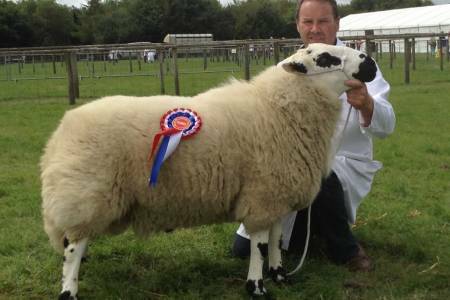 Commercial desirability: The Beltex Sheep Society promotes the breed as having the ability to add conformation to British and halfbred continental sheep. Appearance: This is a large, medium boned sheep with a white face and high quality white fleece. Both sexes are polled (without horns). History: The breed originates from the Cher region of Central France and was improved by the Merino in the 1780s and the British Dishley Leicester in the 1800s. It was established in the UK in the 20th century and the British Berrichon Sheep Society established in 1986. Geography: The Berrichon continues to be popular in France, with the specific British Berrichon found is small pockets throughout the UK. Breed attributes: Primarily a terminal sire breed used to produce fast-growing lambs that are born easily. 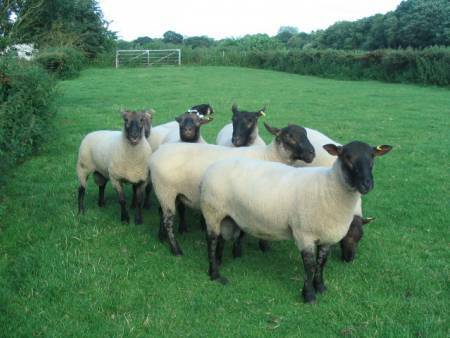 Purebred Berrichon females are unusual in being able to product lambs all year round. 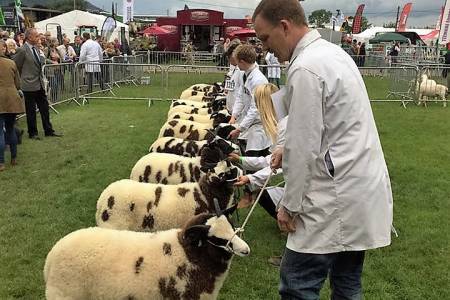 Commercial desirability: The British Berrichon Sheep Society promotes the breed as producing lambs that are born easily, quick to get on their feet and capable of being finished for the food chain to suit varying specifications. Appearance: The speckled face of this breed is predominantly black with white markings. The face and legs are similar, the fleece is white and there is an absence of horns. History: Taking its full name from the Eppynt hills, the Beulah Speckled Face was bred on the hills of Eppynt, Llanafan, Abergwesyn and Llanwrtyd Wells for more than 100 years with no introduction of any other female genetics. The breed society was formed in 1958 to continue work improving the breed. Geography: While remaining popular in its native part of mid-Wales, the Eppynt Hill & Beulah Speckled Face is also found further afield within Wales and over the border. Breed attributes: Slightly bigger and less extreme than the true mountain sheep it was developed from, Beulah’s continue to be hardy upland sheep that can produce purebred lambs to thrive in harsh environments or crossbred commercial lambs for the food chain. 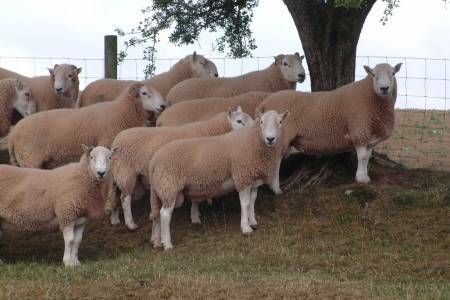 Commercial desirability: The Eppynt Hill & Beulah Speckled Face Society promotes the breed as an ideal cross for terminal sire breeds to produce lambs of good carcase quality, and says there is considerable demand for older Beulah females (draft ewes) to continue their productive live on lowland pastures. 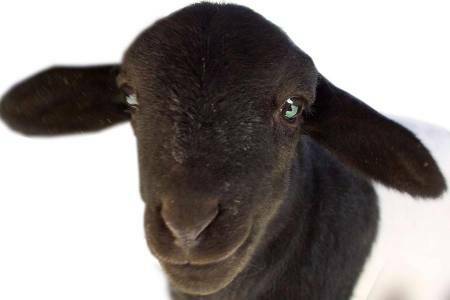 Appearance: These sheep are small, completely black in appearance and have no wool on their face or legs. The ewes are typically polled (no horns) while the males are horned. History: The breed is thought to have been established in the UK in the 13th century, as Welsh writing from the Middle Ages refers to a black-fleeced mountain sheep. 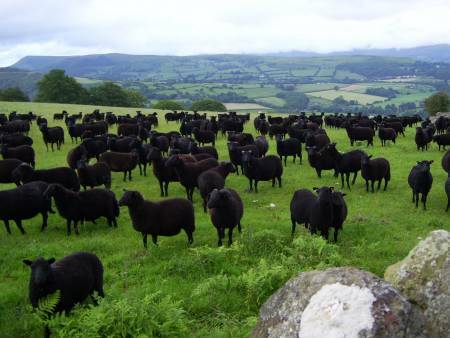 The Black Welsh Mountain Sheep Breeders Association was established in 1920. Geography: The stronghold of the breed is, understandably, in mid-Wales – but it was notably introduced to the USA in 1973 and has a worldwide population of 10,000. 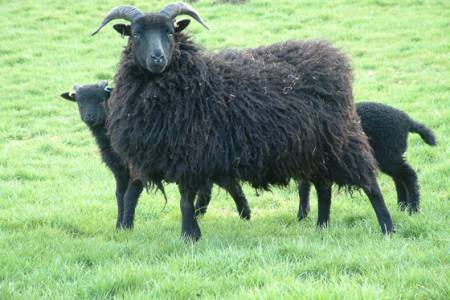 Breed attributes: As a maternal hill breed, Black Welsh Mountain females are prolific with a strong mothering ability. Their hardiness means they can rear lambs in extreme environments. 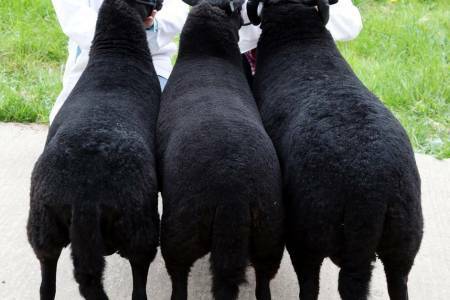 Commercial desirability: The Black Welsh Mountain Sheep Breeders Association promotes the breed as being suitable for both the smallholder and commercial producer. Appearance: Despite the name, Blackface sheep have black or black-and-white faces and legs. 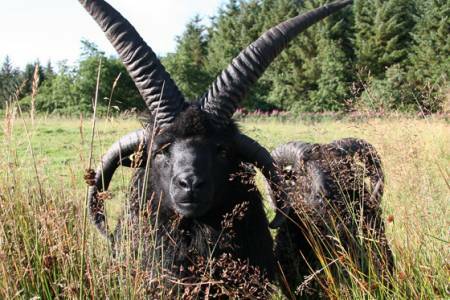 It is a horned breed with several distinct types, the most prominent being the Scottish Blackface which is further spilt into three subdivisions of Perth, Lanark and Northumberland. 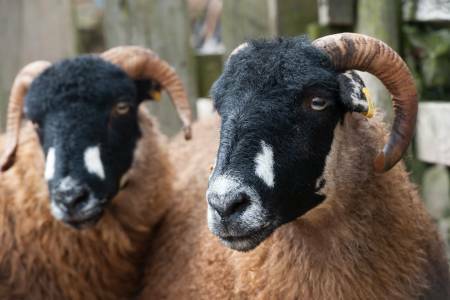 History: The Blackface is thought to have originated in the UK in the 12th century and is from the same genetic umbrella as other horned sheep, such as the Swaledale and Rough Fell. The Blackface Sheep Breeders Association was established in 1901. 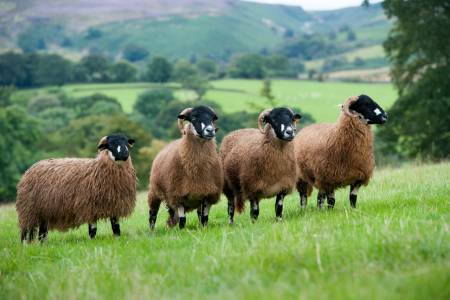 Geography: The Blackface Sheep Breeders Association promotes the breed as being the most numerous in the UK, accounting for roughly 35% of sheep in the country. It is very well established in Scotland, spreading from the Borders to the Highlands and Islands, North East England, Northern Ireland and the USA. 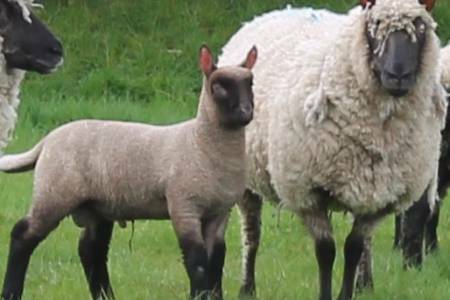 Breed attributes: As a maternal hill breed, the Blackface is a hardy sheep and the females have a strong mothering ability to rear lambs in extreme terrain. The breed is easily hefted, making it ideal for large areas of hill country. 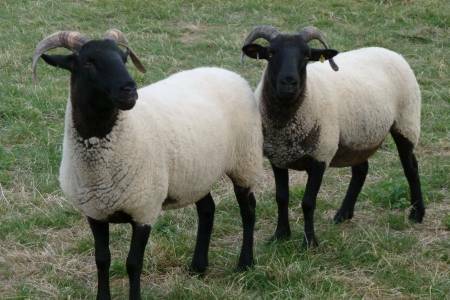 Commercial desirability: The Blackface Sheep Breeders Association promotes the breed as being able to produce sheep for every climatic condition, thanks to the different distinct types within the breed. Appearance: With no wool on its head, the blue-grey skin of the Bleu du Maine gives it a very distinct appearance. It has a white fleece and no horns. History: The breed originated in the 19th century in Western France, with a breed society created in the UK in 1978. 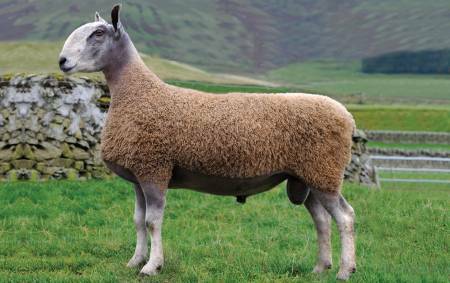 The addition of a ‘Millennium Bleu’ was created in 2000 by crossing a Bleu ewe with a Beltex ram. Geography: The breed is well-established in France and the Netherlands, being introduced to the UK between 1978 and 1982. 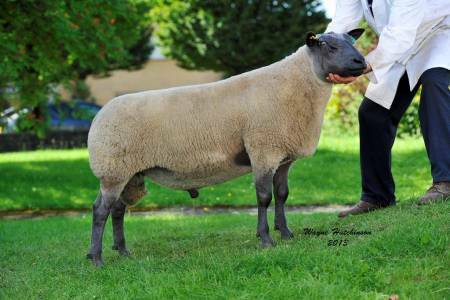 Breed attributes: Bleu du Maines are large sheep that combine maternal and terminal sire traits of prolificacy, easy lambing ability, milkiness and improved conformation. 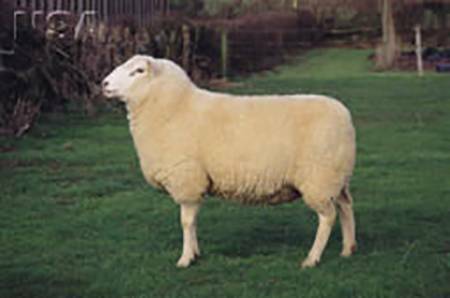 Commercial desirability: The breed was primarily promoted in the UK as a female producer, but also has a reputation as a useful terminal sire on downland and hill breeds. 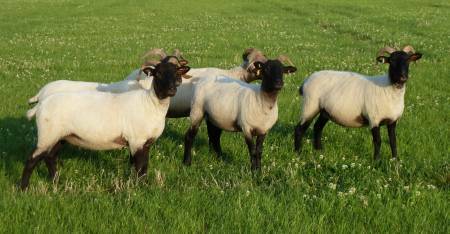 More information on the Bleu du Maine Sheep Society website. Appearance: The Blue Texel is similar in shape to the Texel but completely different in colour. 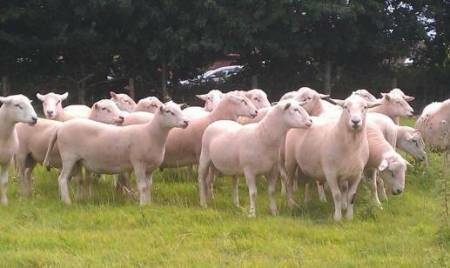 The blue is a recessive gene in the Texel breed that gives colour to the skin and fleece. The blue patterned fleece varies in shade but no part is wholly black or white, while the head, ears and legs also carry a mix of black and white markings, particularly a white ‘halter mark’ on the head. History: Like the Texel, the breed originates from the Texel Island of Holland. It was developed from the 1970s and later introduced to the UK. 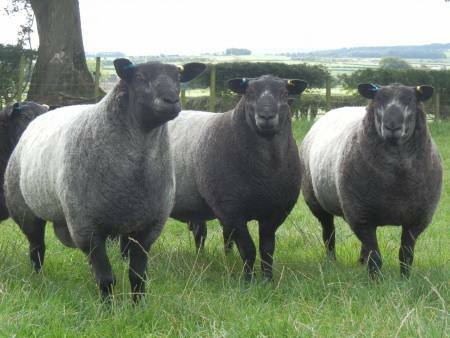 Geography: Blue Texels are primarily found in Holland and the UK. 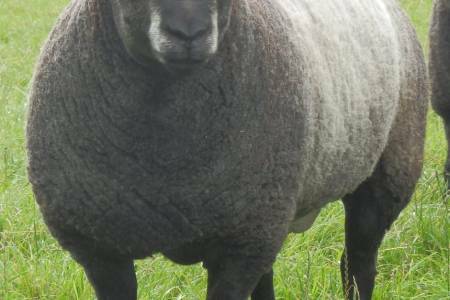 Breed attributes: As a commercial terminal sire breed, the Blue Texel crosses well with all types of females and, as the blue colouring is a recessive gene, most crossbred offspring will be white. Lambs are vigorous at birth and grow well. 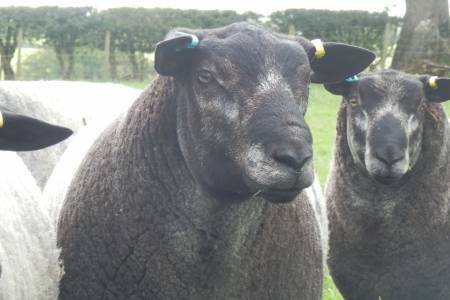 Commercial desirability: The Blue Texel Sheep Society promotes the breed as having a narrower head than the normal Texel, providing for easier lambing but still producing lambs that will grow to a suitable size and shape for the food chain off grass. Appearance: This breed has a characteristic Roman nose and a blue skinned head showing through white hair. It is well known for standing tall and proud with alert eyes and long upright ears. History: The Bluefaced Leicester evolved from a breeding scheme in Northern England in the 19th century, hence it sometimes being known as the ‘Hexham Leicester’. 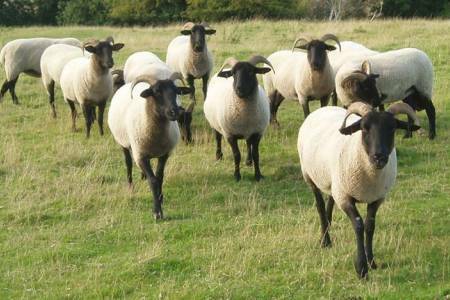 The Bluefaced Leicester Sheep Breeders Association was established in 1963. Geography: Following its early concentration in Northern England, the Bluefaced Leicester is now a popular crossing sired throughout the UK. Many types of Mule sheep in the UK are the result of crossing a hill breed to the Bluefaced Leicester, meaning its genes are found in every corner of the country. Breed attributes: Bluefaced Leicesters are hardy, early maturing and prolific, all traits that are highly prized within Mule breeds when the Bluefaced Leicester is crossed with a hill breed. 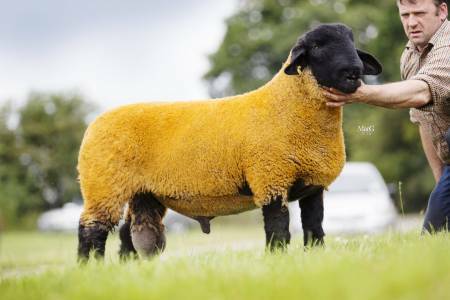 Commercial desirability: The Bluefaced Leicester Sheep Breeders Association promotes the breed as being the most popular crossing sire in the British Isles. Appearance: This large, hornless sheep has prominent, erect ears and a Roman nose. It has white, demi-lustrous wool on its body, but none on its face or legs. History: A breeding programme involved crossing the famous Dishley Leicester flock with Teeswaters or Cheviots in the 18th century to give Blucaps or Redlegs. The favoured Redleg became the Border Leicester in 1850, with the flockbook established in 1898. 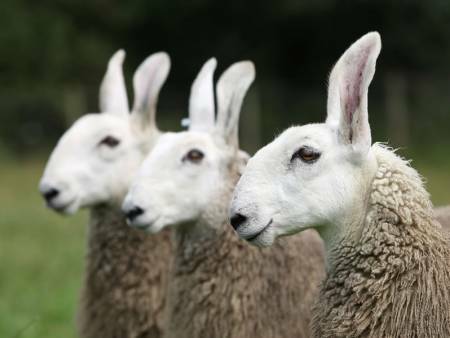 Geography: Border Leicesters are recognised as a rare breed with remaining flocks found mainly in Northern England and the Scottish lowlands and Borders. 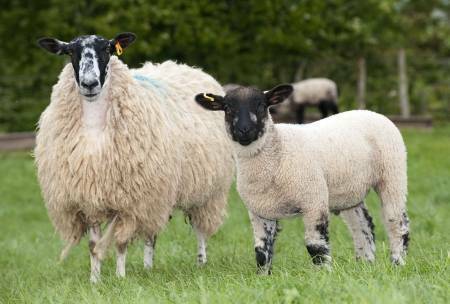 Breed attributes: The traits of a Border Leicester include good mothering ability and fast growing, early maturing lambs. These are passed to Mule sheep when then Border Leicester is crossed with a hill breed. 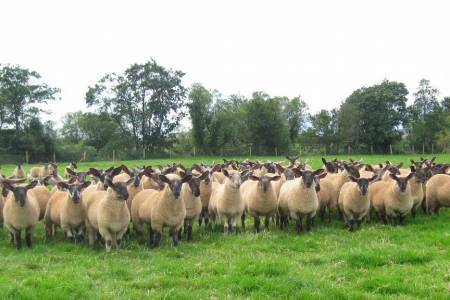 Commercial desirability: The Border Leicester Sheep Breeders Society promotes the breed has being the largest indigenous breed in the British Isles with the ability to produce Mule sheep that are versatile to many farming systems. Appearance: This small, naturally short-tailed sheep is creamy white with various black, tan or speckled markings on its face and legs, as well as sometimes also on the body and shoulders; a few dark animals also occur. It is among a small number of sheep that naturally sheds their wool during the year. History: Boreray sheep are descendants of the sheep domesticated by inhabitants of the islands of St Kilda, developed into a distinct breed in the 19th century. When the main St Kilda island of Hirta was evacuated in 1930, a flock were left to live feral on the tiny island of Boreray. They were later rescued and registered with the Rare Breed Survival Trust as ‘critically endangered’. The flock book was incorporated into the Soay & Boreray Sheep Society in 2003. Geography: Boreray is one of four St Kilda islands, the most westerly archipelago of the Outer Hebrides of Scotland. Having originated there, tiny numbers of Boreray sheep are now kept in flocks around the UK to preserve the genetics. Breed attributes: As a hill and upland breed, Boreray sheep are very hardy and able to thrive on sparse grazing in most conditions. They are long-lived and able to naturally shed their fleece. Commercial desirability: The Soay & Boreray Sheep Society promote the unique character of the breed with a special history and desirable breed attributes. Appearance: A broad-backed sheep with a white face, legs and fleece. Females are always polled (without horns) but males can be polled or horned. History: The Brecknock Hill Cheviot was established in the Brecon Beacons 400 years ago, descended from the early border Cheviot. It was only recognised as a distinct breed upon further development in the mid-19th century. Geography: While the Cheviot is originally from Scotland, the Brecknock Hill Cheviot is particular to the Brecknockshire area of Wales. Breed attributes: This is a hill breed that is very hardy and long-lived, but is also adaptable to lowland farms. 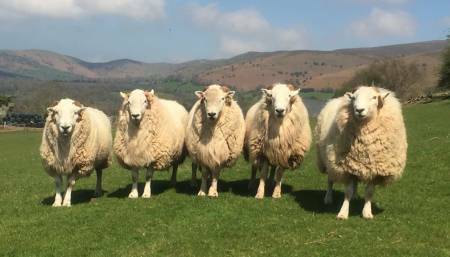 Commercial desirability: The Brecknock Hill Cheviot Sheep Society promotes the rams as a crossing sire to improve the size and wool quality of native mountain breeds, while ewes make excellent breeding replacements. 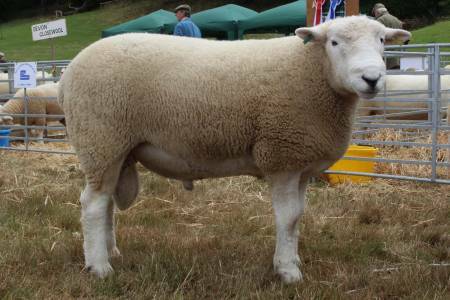 Appearance: This medium to large-sized sheep has a predominantly white face and legs. The head is usually free from wool, the muzzle broad and ears long. It has a white fleece. 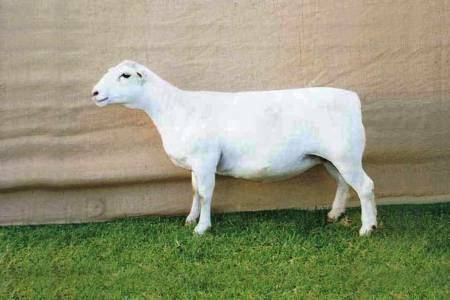 History: The British Milksheep was developed in the 1960s and 1970s as a high performance crossing breed with an emphasis on milkiness. Geography: The breed is found in small numbers around the UK, as well as Canada and Hungary. 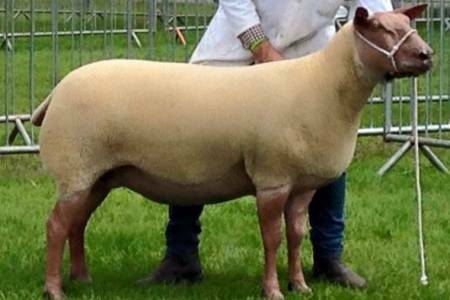 Breed attributes: British Millksheep males will sire crossbred daughters with good prolificacy and milk yield to support her daughters. The same traits of prolificacy and milk yield, coupled with a quiet temperament, mean purebred females can also be used as a dairy ewe. 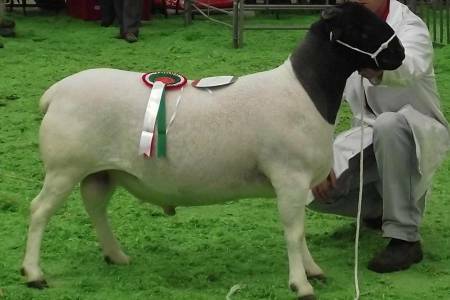 Commercial desirability: The British Milksheep Society promotes the breed as robust and adaptable. 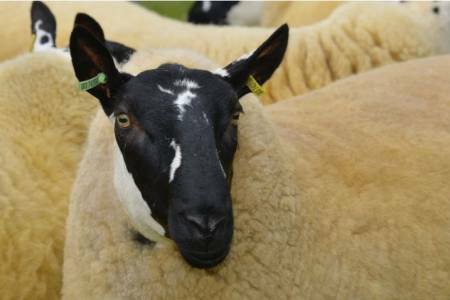 Appearance: Cambridge sheep are dark faced with a white fleece. They are medium sized but with a long frame that gives the breed a reputation for producing lambs that are heavier than they look. History: The breed was first developed in 1964 at Cambridge University when Finnish Landrace rams were mated with native breeds such as Clun Forest, Llanwenog, Lleyn, Kerry Hill, and Suffolk cross Welsh Halfbreds. The Cambridge Sheep Society was established in 1979. Geography: Suited for many parts of the UK, the Cambridge has proved to be most popular in the Welsh Borders. 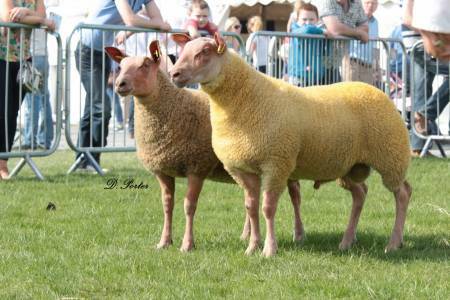 Breed attributes: Cambridge sheep have been selectively bred for prolificacy and milk production in the females, plus growth and carcase traits in their offspring. 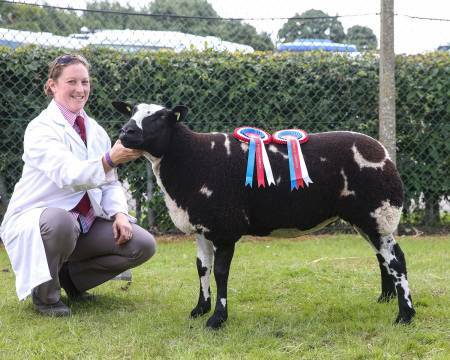 The breed is suitable for crossing with both Terminal sire and Hill and Upland breeds..
Commercial desirability: The Cambridge Sheep Society promotes the breed for crossing, boosting prolificacy and providing easy lambing in other breeds. Appearance: Castlemilk Moorits are one of the largest primitive breeds. Both the ewe and ram are horned. The brown fleece should be fine and kemp free. 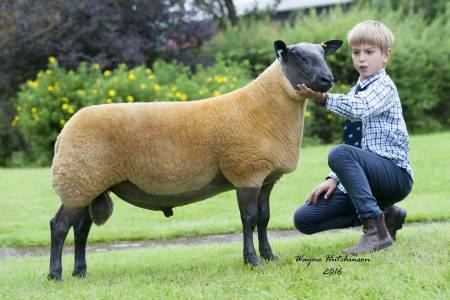 History: The breed was first developed by Sir Jock Buchanan-Jardine during the early twentieth century from Manx Loghtan, Moorit Shetland and wild Mouflon sheep. 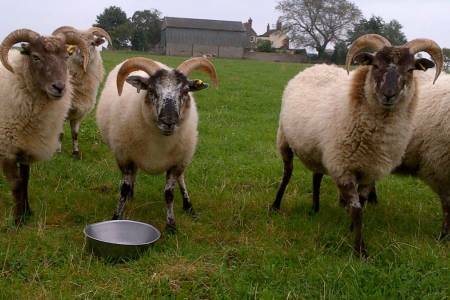 RBST founder Joe Henson brought the breed back from the brink of extinction following the sale of the original flock in 1970. Breed attributes: Castlemilk Moorits are one of the largest primitive breeds. The ewes should demonstrate strong maternal instincts. The Castlemilk Moorit should be well balanced and agile. 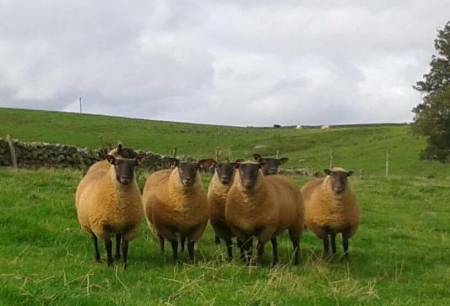 Commercial desirability: The Castlemilk Moorit Sheep Society promotes the breed for its ability to graze rough ground, delicious tasting meat and its fine fleece. Appearance: This breed has a short, deep body and fine bone structure. The pink head and ears are small and the eyes distinctively large. History: The Charmoise Hill was developed in the 18th century in the Loir et Cher region of Central France, using Kent rams exported from England to give shape to the native hill sheep there. 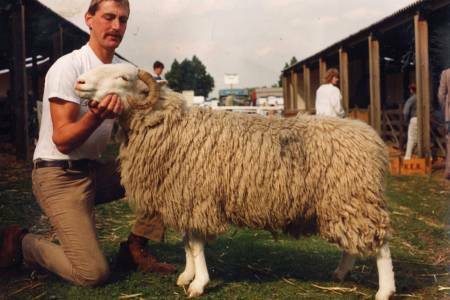 While many terminal sire breeds have been imported into the UK from the continent, this was one of the first hill breeds. Geography: While continuing to be popular in France, Charmoise Hill sheep are found in pockets around the UK with increased prevalence in Wales. 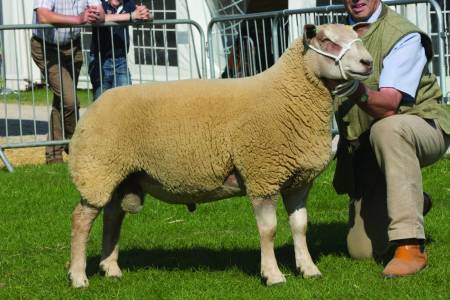 Breed attributes: A hill breed developed in difficult environmental conditions, the Charmoise Hill can be used as a terminal sire to add shape and meat yield to sheep in many different management systems. Commercial desirability: The Charmoise Hill Sheep Society promotes the breed as being versatile, able to lamb out of season and good at retaining body condition in harsh environments. Appearance: The Charollais is a large, well-muscled animal. The head is pinkish with creamy/sandy hair but no wool. Animals often have a distinctive white flash above each eye. The fleece is white. History: Developed in the 19th century from local French breeds and the British Dishley Leicester, the Charollais was first imported to the UK from France in 1976. 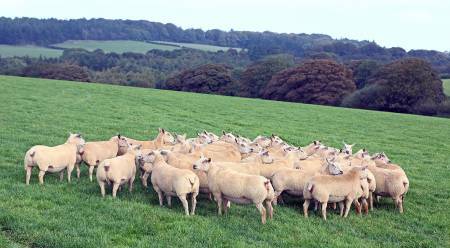 The British Charollais Sheep Society was established the year after with the role of further developing the breed for UK farmers. Geography: The British Charollais is well established throughout the UK as a commonly used terminal sire. The breed also continues to be popular in France, as well many other countries throughout Europe, Australasia and South America. Breed attributes: A terminal sire breed with fine bones to produce a good meat-to-bone- ratio in lambs for the food chain. 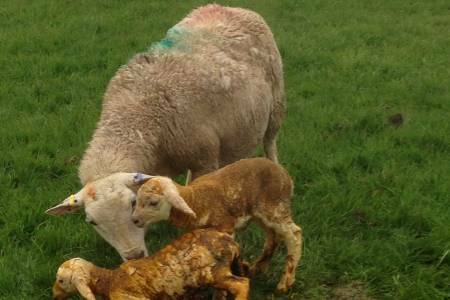 Traits include ewes that are prolific and easy lambing, rearing fast-growing lambs. 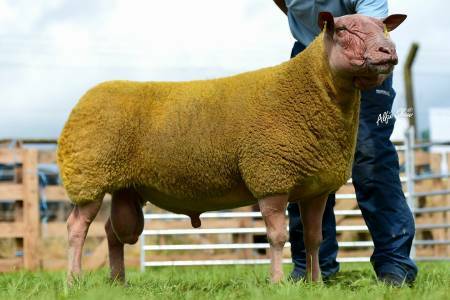 Commercial desirability: The British Charollais Sheep Society claims the breed is the second most popular terminal sire in the UK, due to the excellent fleshing qualities and growth in prime lambs. Appearance: While there is more than one type of Cheviot sheep to have originated from the Cheviot Hills between Scotland and England, the South Country Cheviot is known for its alert appearance, distinctive white face and legs, and dense white fleece. The fleece forms a ‘ruff’ behind the ears and males are sometimes horned. History: The breed originated in the Cheviot Hills and was mentioned in local writings as far back as 1372. There has been much breed development since, including for fleece quality when many Merino sheep were imported into the port of Berwick in 1480-1560. The Cheviot Sheep Society was established in 1890. 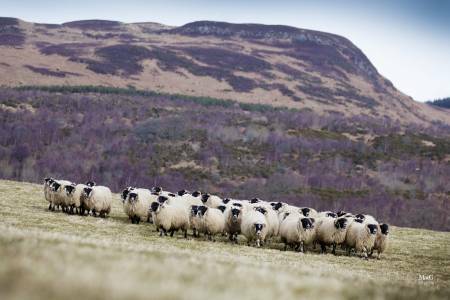 Geography: The breed has stayed local to its origins in the Cheviot Hill, with flocks found in Northern England and the Scottish Borders. Popularly has also been seen in South Wales. Breed attributes: A very hardy, maternal hill breed with females with good mothering ability producing fast-maturing lambs. 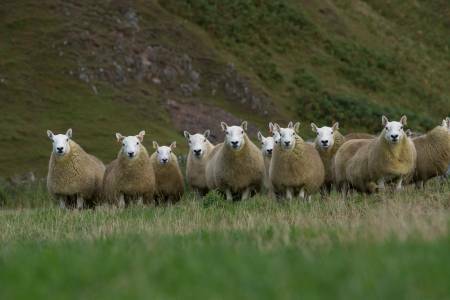 Commercial desirability: The Cheviot Sheep Society promotes the breed as able to live off the hill all year round while being able to product quality lambs for the food chain. 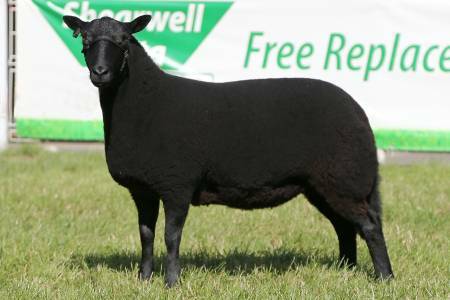 Appearance: The Clun Forest is a medium-sized sheep with a dark, narrow face and alert ears, dark legs and white fleece. History: The breed name comes from the town of Clun on the Welsh Border and surrounding forests of Shropshire. It can be traced back as far as 1803, when it was originally white faced. The face darkened as the breed was developed by crossing with Longmynd, Radnor and Shropshire sheep. The breed society was established in 1925. 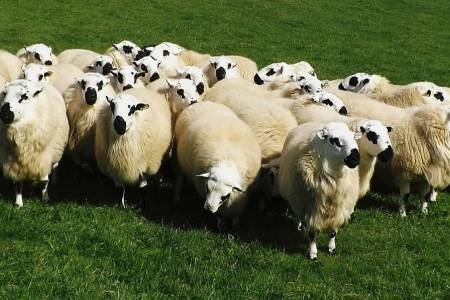 Geography: The breed continues to be found on the Welsh Border in Shropshire and Powys, with flocks also further into Wales, the South England Downs and Scotland. Breed attributes: A maternal breed that is good for crossing with terminal sire breeds to produce Mules and Halfbred females capable of rearing quality lambs for the food chain. 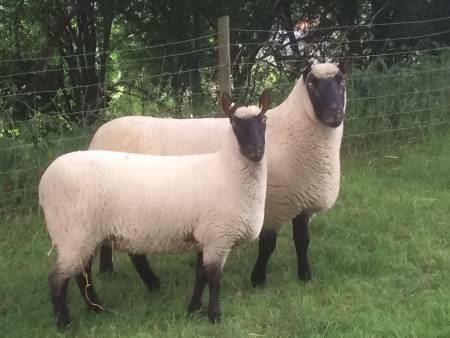 Commercial desirability: The Clun Forest Sheep Breeders Society promotes the breed as a crossing sheep with good conformation, the ability to finish off grass and adaptable to a variety of climates. Appearance: The distinctive feature of Cotswold sheep is its thick set, long, lustrous, white fleece. 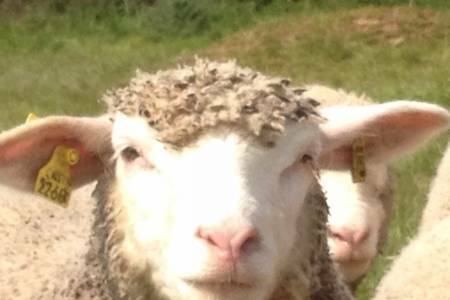 Beneath a mop of wool growing right up onto the head, the face is usually white but can occasionally be mottled with black spots on the points of the ears. Both genders are long and tall with no horns. History: Originally introduced to the UK by the Romans, the ‘golden fleece’ of Cotswold sheep was the most important UK export in Medieval times. While many Cotswold towns and villages were developed on the wealth of the wool trade, the breed is now classified as rare. The breed society was established in 1891. Geography: Recognised as a rare breed, these sheep continue to be found in the Cotswold area of England, with specialist flocks also found in other parts of the UK. 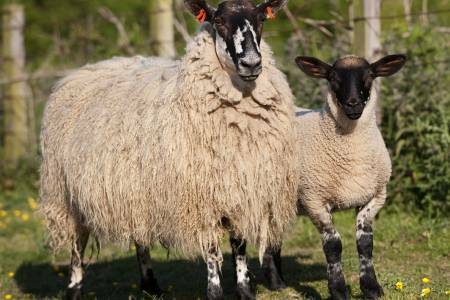 Breed attributes: The high quality fleece remains the most important feature of Cotswold sheep, but the breed can also offer hardy, large lambs born easily out of mothers with plenty of milk. 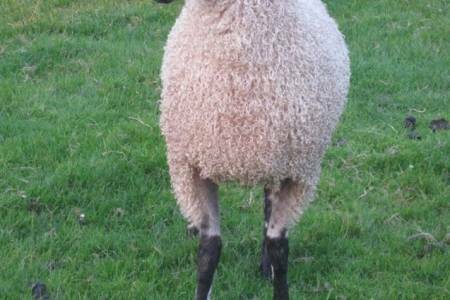 Commercial desirability: The Cotswold Sheep Society promotes the breed as offering a quality fleece that is highly sought after by spinners and crafters, while the sheep themselves have an increasing ability to grow and fatten on good pasture so are relevant to meat production as well as wool. 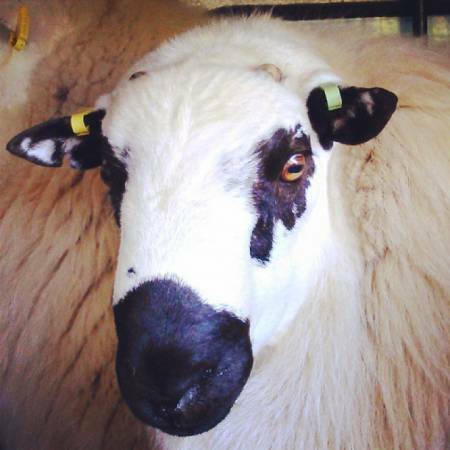 Appearance: Dalesbred sheep have a black face with distinctive white marks around the muzzle and a white fleece. Both sexes have a round, low set of horns. 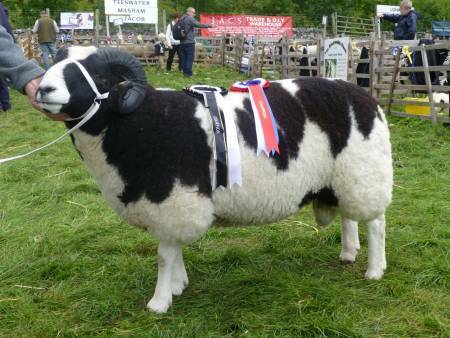 History: The breed shares its origins with Swaledale and Blackface sheep, but an official split of the Swaledale and Dalesbred Sheep Breeders Association in 1925 resulted in the Dalesbred going its separate way to concentrate on its own breed specifications and suitability to cross with a Teeswater to produce Masham sheep. Geography: The breed remains local to its origins in Upper Wharfdale in the Pennines, across Lancashire and Yorkshire. Breed attributes: A very hardy hill breed with strong maternal traits, most commonly crossed with Teeswater rams to produce the Masham. Commercial desirability: The Dalesbred Sheep Breeders Association promotes the breed for its maternal abilities and suitability for conservation grazing schemes. 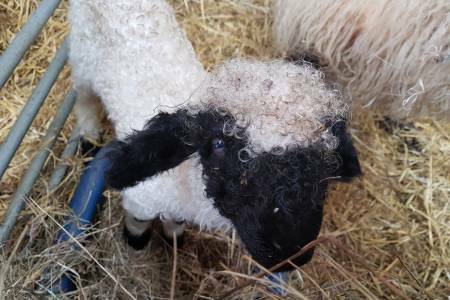 Appearance: This compact, agile breed has a black and white face and legs with a white fleece. It does not have horns. History: The breed originated on the hills of the Dale of Goyt in the Peak District in 1770-75, when it was known as the Dale O'Goyt sheep. The Derbyshire Gritstone evolved from this, making it one of the oldest British hill breeds. 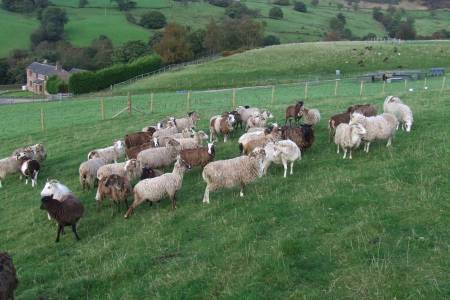 The Derbyshire Gritstone Sheep Breeders Society was established in 1906. Geography: The breed remains local to its origins in the Goyt Valley, Peak District and Pennines. Breed attributes: A very hardy and robust hill breed with strong, good mothers. 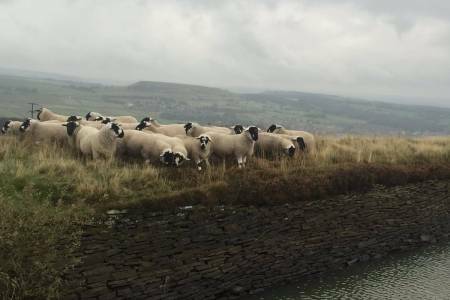 Commercial desirability: The Derbyshire Gritstone Sheep Breeders Society promotes the breed as being economical on high ground with the ability to produce lambs with relatively rapid growth rates for a hill breed. Appearance: When carrying a full fleece, the Devon & Cornwall Longwool is quite unmissable. The white fleece is of remarkable size and quality, covering most of the white face and legs. The breed is shorter and bulkier than other longwool breeds. Both sexes are polled (without horns). 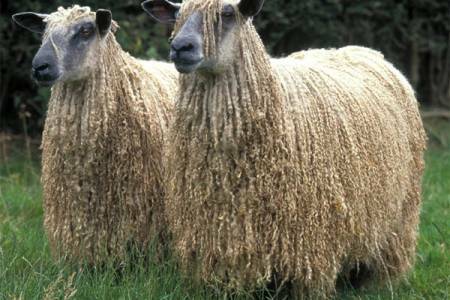 History: Long-woolled sheep have been in South West England for centuries, and the Devon & Cornwall Longwool is an amalgamation of South Devon and Devon Longwool sheep, developed in the 18th century. 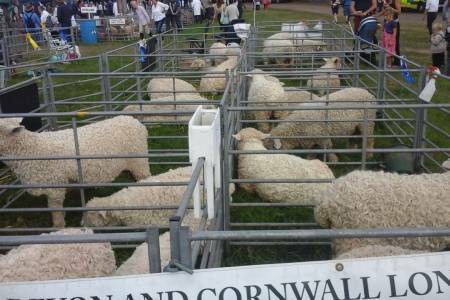 The Devon & Cornwall Longwool Flockbook Association was established in 1977. 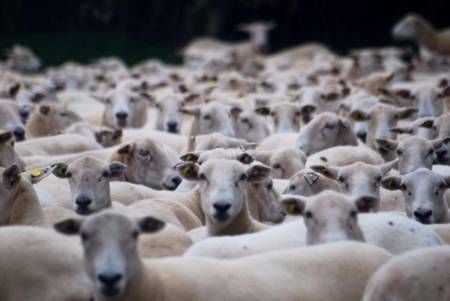 Geography: Now recognised as a rare breed, there are few flocks outside South West England. 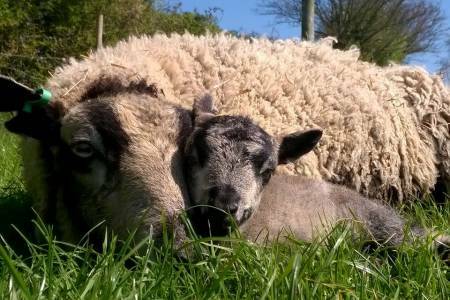 Breed attributes: In additional to producing large amounts of wool, so much in fact that even the lambs can be shorn, Devon & Cornwall Longwoods are hardy sheep with good mothering ability. 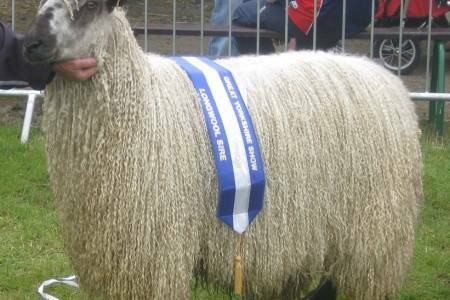 Commercial desirability: The Devon & Cornwall Longwool Flockbook Association promotes the breed society as producing more wool per sheep than any other breed, while also being a suitable for crossbreeding and meat production. Appearance: A medium sized sheep, the Devon Closewool has a white face with black nostrils and a dense white fleece. History: The breed was developed in the mid-1800s when Exmoor Horn sheep were crossed with Devon Longwools. 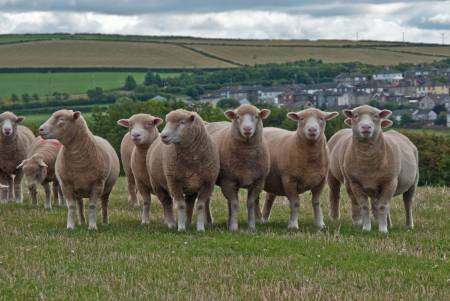 The Devon Closewool Sheepbreeders Society was established in 1923. Geography: Even at the height of its popularity, the bred mostly remained local to its origins in Devon. Now a recognised rare breed, it continues to be found predominantly in South West England with a small amount of export success. 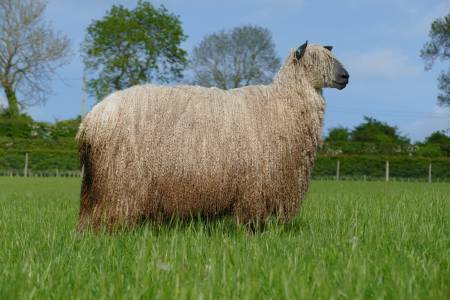 Breed attributes: The Devon Closewool’s dense fleece and stout frame contribute to its hardiness. It will produce quality meat for the food chain as pure animal or perform as a crossing animal. Commercial desirability: The Devon Closewool Sheepbreeders Society promotes the breed as being docile, easy care and low input, productive and prolific. Appearance: Dorpers have a black head and white body, while the White Dorpers have white heads. History: The breed was created in South Africa in 1942 by crossing Dorset Horn rams with Persian Blackheaded ewes. It was exported around the world, coming to the UK in 2004. Geography: Found in North and South America, Europe, Australia, New Zealand and Canada, numbers are relatively small in the UK. Breed attributes: Developed as an easy care breed, the Dorper does not require shearing yet can survive in extreme cold and heat. 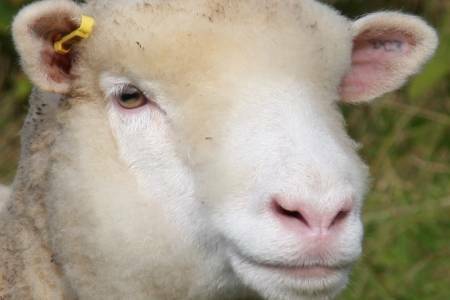 It is claimed to have skin twice the normal thickness of other sheep, making it impervious to insect bites. 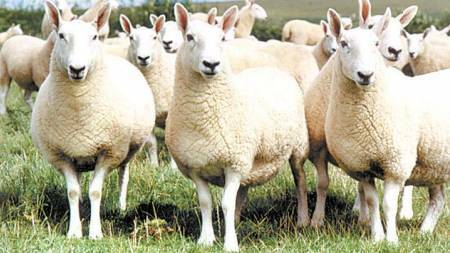 Commercial desirability: The Dorper and White Dorper Society of Great Britain promotes the breed as able to adapt and flourish under extremes of climate conditions, with huge potential to be crossed with native UK breeds to produce composite breeding ewes. Appearance: This hornless, medium sized breed is stocky in build with a dark brown head and legs. It has a high quality white fleece. 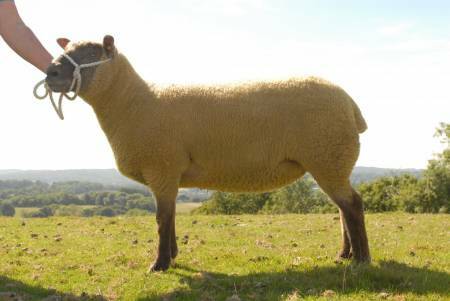 History: The Dorset Down was developed in the 1800s as a result of crossbreeding Wiltshire, Berkshire and Hampshire ewes with Southdown rams. 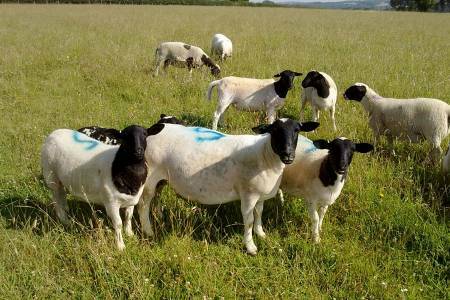 The Dorset Down Sheep Breeders Association was established in 1906. 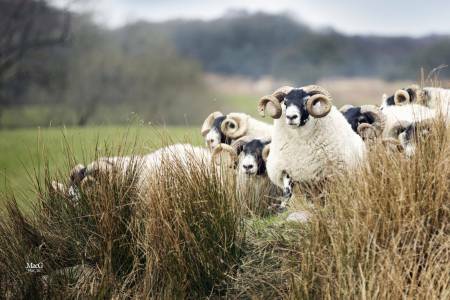 Geography: From its origins in Dorset, the breed has found favour throughout lowland areas of the UK over the years but is now recognised as a rare breed. 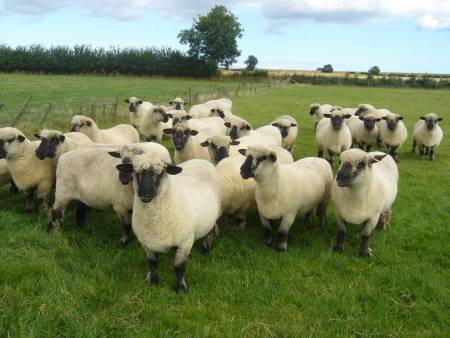 Breed attributes: A terminal sire breed, the Dorset Down produces early-maturing lambs for the food chain as well as a desirable fleece that is higher quality than many other native UK breeds. 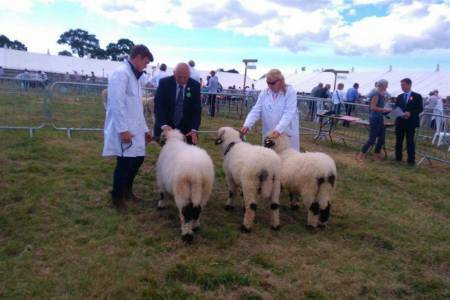 Commercial desirability: The Dorset Down Sheep Breeders Association promotes the breed as producing prime lambs that are born easily with little trouble to their mothers, while rams are unusual in being able to work at all times of the year. Appearance: Both the horned and polled (hornless) type are stocky, white faced sheep with a distinctive pink nose and thick cream fleece. Both sexes of the Dorset Horn are horned, with the males growing large spirals. History: Some of the earliest records of the Dorset Horn date back to 1693, and it was in 1891 that a flock book was published setting out the breed standards still adhered to today. Once the breed was exported to Australia in the early 20th century, it was crossed with a variety of breeds to create the Poll Dorset. It was then exported back to the UK and became more popular than the horned type, with both being eligible for registration with the breed society. Geography: From its origins in South West England, the breed is found throughout the UK, mainly as the Poll Dorset type. It has been widely exported, spreading through Europe in the 1900s and finding popularity in Australia, New Zealand, North America and South Africa. In comparison, the Dorset Horn type is recognised as a rare breed. Breed attributes: The breed has a slightly shorter gestation period than other sheep, and the unusual ability to breed out of season, so females can produce three crops of lambs in two years. It is a prolific breed suited to the lowlands. 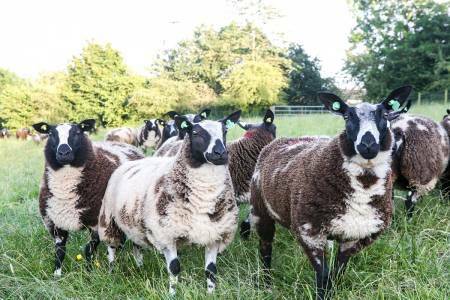 Commercial desirability: The Dorset Horn & Poll Dorset Sheep Breeders promotes the breed as adaptable, able to thrive on most types of grazing and suitable to produce large numbers of lambs if managed correctly. 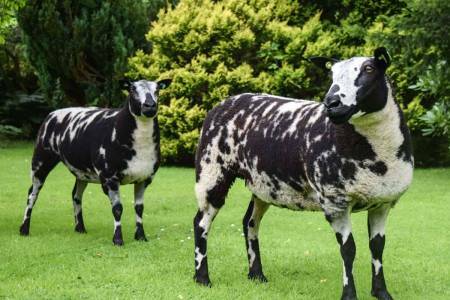 Appearance: The Dutch Spotted sheep has a distinctive appearance with dark brown / black and white fleece with clear variation in markings all over the body. The sheep is medium sized. Neither male or females are horned. History: The Dutch Spotted Sheep originates from Holland where the breed can be traced back to before World War One. The purpose of this hardy breed of sheep was originally to graze the dykes in Holland helping with the maintenance. Breed attributes: The breed is hardy. Ewes lamb easily. They are easy to handle with an inquisitive nature. 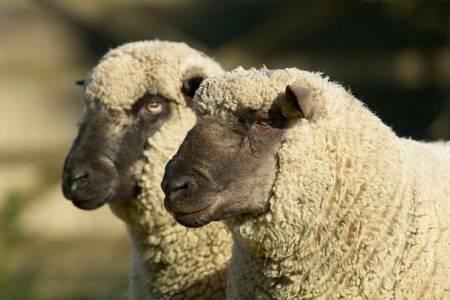 Commercial desirability: The Dutch Spotted Sheep Society promotes the breed as able to thrive in grass based systems producing high quality meat carcase with leanness and unique taste and eating quality. Appearance: Bred specifically for its low management requirements, Easy Care sheep are small, wool-shedding sheep with white faces and bodies. History: The composite breed was developed in the 1960s, predominantly by crossing the Wiltshire Horn (which has little or no wool) with Nelson Welsh Mountain sheep. Continued genetic improvement established the Easy Care as a breed in its own right, with the first society sale held in 2009. Geography: The breed has found favour with a number of shepherds throughout the UK, as well as being exported to Germany, Holland and France. 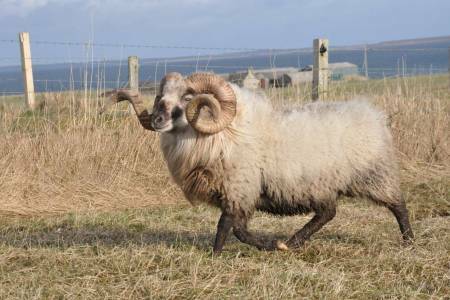 Breed attributes: The ability to shed its own wool is the main characteristic of this breed, which thrives in the lowlands but can also be kept on more extreme terrain in most weather conditions. It has also been developed to easy lambing. Commercial desirability: The Easy Care Sheep Society promotes the breed as requiring minimal shepherding or veterinary care, yet still providing excellent meat yields and prolificacy. Appearance: A heavy-boned sheep with a speckled face and legs and a white fleece. Its speckles can be grey, brown or black. Males are horned. History: This native Welsh sheep had been specifically bred for the harsh upland environment of Mynydd Epynt, which is a tough environment and a military training ground that requires sheep to remain ‘hefted’ to specific areas of the mountain. 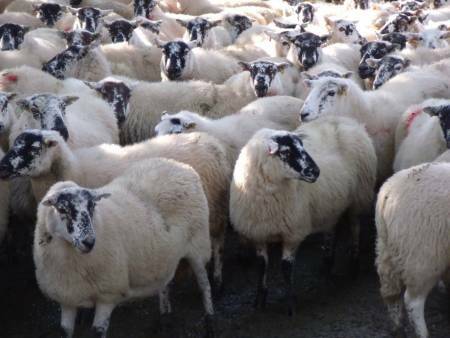 Geography: Epynt Hardy Speckled Face sheep have predominantly remained within the area where they originated. Mynydd Epynt lies between the Cambrian Mountains in the North and the Brecon Beacons in the South. Breed attributes: A very hardy hill breed with strong mothering instincts and the ability to thrive in a harsh environment with limited supplementary feeding. 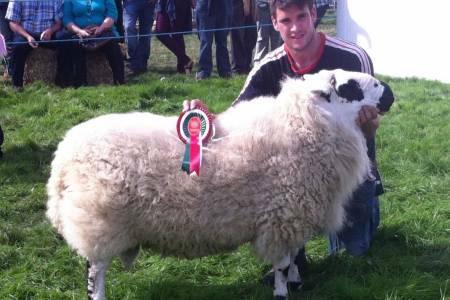 Commercial desirability: The Eppynt Hardy Speckled Face Sheep Society promotes the breed as hardy and long-lived with good mothering ability. 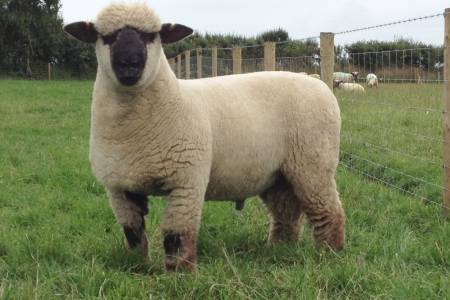 Appearance: Bred specifically for its commercial performance, this sheep breed is completely white in colour and is more similar to a hair sheep than a traditional UK breed due to the fact its coat resembles wool over the winter months but rarely exceeds 2cm in length or 1kg in weight. History: Derived from the Latin for ‘without wool’, the breed was developed from 2005 by a group of farmers in South West England. 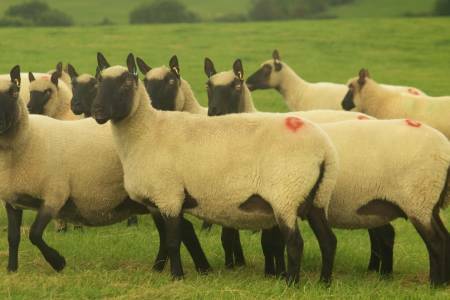 The Sheep Improved Genetics group developed the Exlana composite from 14 breeds of sheep around the world, based on breeding objectives around easier management. 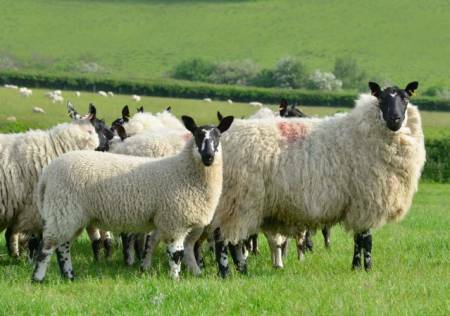 Geography: Nucleus Exlana flocks continue to be found in South West England, but the breed is now known about throughout the UK and attracts attention from producers in many places. 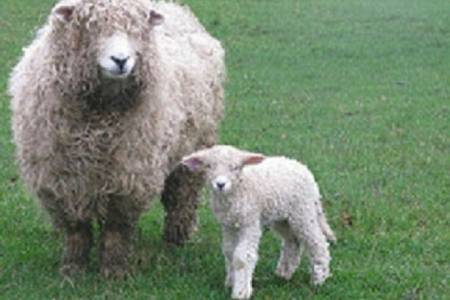 Breed attributes: In addition to the breed’s ability to shed what little wool it has in the summer, removing the need for shearing, this maternal breed has also been developed for prolificacy and mothering traits. The females are selected for the ability to lamb outdoors with minimum intervention. 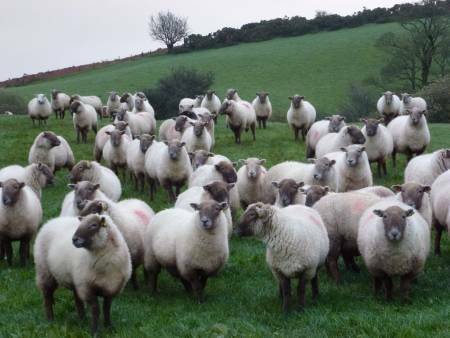 Commercial desirability: Sheep Improved Genetics promotes its philosophy for easier management and lower inputs, stating its aim as breeding genetically improved sheep to sustain a viable UK sheep sector. It says it continues to look at improvements in the breed through extensive performance recording, such as selecting for animals with resistance to common internal parasites. Appearance: With a white face, black nostrils and a good quality white fleece, the distinctive feature of this breed is that both males and females have impressive horns. For the males, these spiral outwards, away from the face. History: The Exmoor Horn was developed in the 19th century from an early horned sheep found grazing in the local area for hundreds of years. The Exmoor Horn Sheep Breeders Society was established in 1906. Geography: Having originated in Exmoor, the breed continues to be found predominantly in South West England. Breed attributes: Exmoor is a harsh environment with sparse, upland pasture and harsh winters. 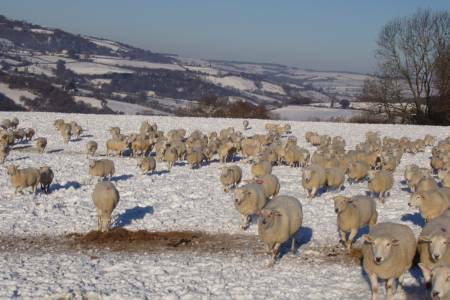 The Exmoor Horn was developed to thrive in these conditions, producing lambs for the food chain that are fast-finishing once brought to better quality, lowland pastures. The breed can be crossed with the Bluefaced Leicester to produce the Exmoor Mule. Commercial desirability: The Exmoor Horn Sheep Breeders Society promotes the breed as hardy yet docile and suitable in sensitive landscapes where conservation grazing is important. Appearance: Friesland sheep have large frames, white fleeces, a narrow head without horns, a long and bald tail, and pink nose and lips. History: The breed was first recorded in the UK in 1953, with a breed society established in 1980 to promote the female Friesland as a dairy ewe. Geography: Frieslands originated in Holland and are now kept in specialist flocks in the UK. 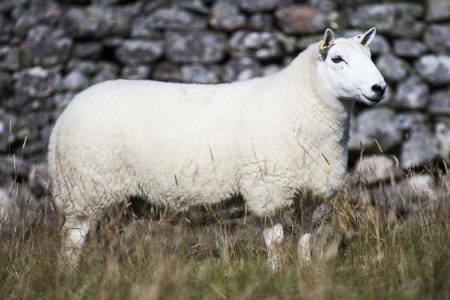 Breed attributes: The breed originated in an upland/heathland environment and is known predominantly a dairy ewe, offering prolificacy and high milk production. It can be used within a commercial cross to increase milkiness in breeding females. 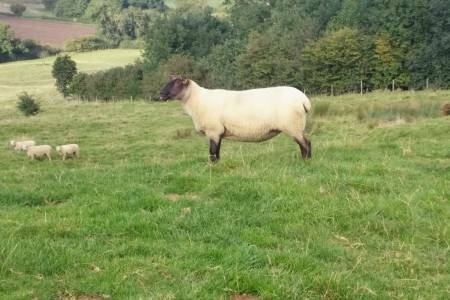 Commercial desirability: Predominantly a dairy ewe but can be used as a commercial cross. Appearance: A medium-sized, fine-boned sheep with a black head that sometimes has a small white patch on top. The legs are also black, long and slender, and the tail is natural short. The fleece is long and curly and comes in shades from light grey to a dark charcoal colour. History: The breed was established on the Swedish island of Gotland by the Vikings but became the animal we are familiar with today when Swedish breeders began developing it from the 1940s into a larger, more commercially viable animal bred with a strong emphasis on producing quality pelts. It was first imported to Scotland in 1972. Geography: While British Gotland has spread from its origins in Scotland throughout the UK. Breed attributes: The Gotland is a semi-hardy breed that is adaptable to a variety of management systems if good quality forage is available. The breed is sought after for its quality fleece and females are prolific, milky and have good mothering ability. 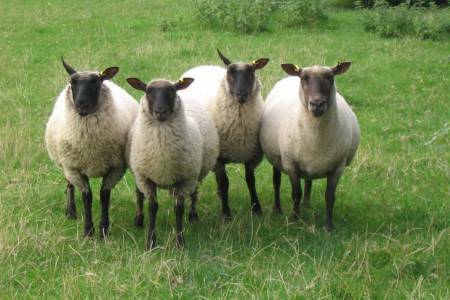 Commercial desirability: The British Gotland Sheep Society promotes the breed as being larger, quieter and more friendly than some other primitive Northern short-tailed breeds. 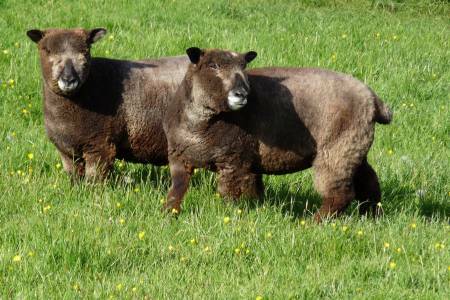 Appearance: Hampshire Downs have a rich, dark brown/black face and ears with white wool covering the body and stretching up onto the head. They are broad, strong animals. History: The breed was developed in the mid-1800s by crossing the Wiltshire Horn and Berkshire Knot with the Southdown. 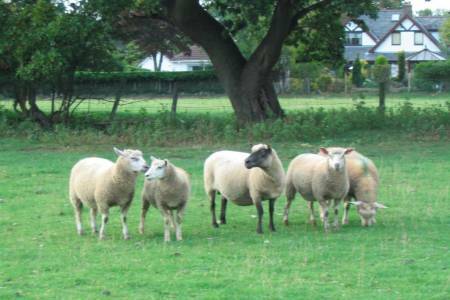 The Hampshire Down Sheep Breeders Association was established in 1889. Geography: The breed is spread throughout all parts of the UK with growing popularity in Scotland, Ireland. It is also a popular breed in Belgium, Holland and France as well as Australia and South America where it is used extensively as a terminal sire. 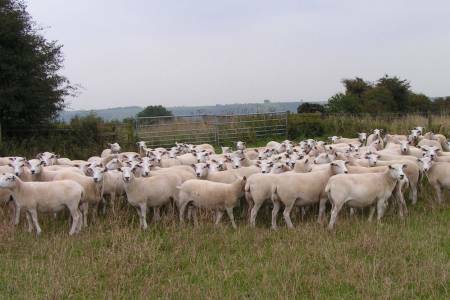 Breed attributes: As a native terminal sire breed, the Hampshire Down breed produces quality lambs for the food chain without outstanding tenderness and taste. Either purebred or crossbred, they are fast maturing off pasture on low-input systems. The females are long-lived and easy lambing. 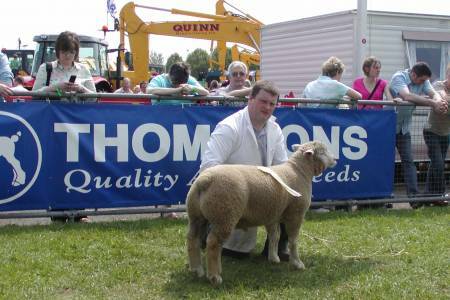 Commercial desirability: The Hampshire Down Sheep Breeders Association promotes the breed as having one of the highest eye muscle scores of any breed, resulting in excellent lamb chops for the food chain. They are one of the most extensively recorded breeds for commercial traits and have made rapid progress in recent years in carcase quality and growth rates. Appearance: The Hebridean is a small sheep with fine bones and black wool that sometimes fades to brown at the tips and often becomes grey in older sheep. The fleece has a soft insulating undercoat with a coarser, rain-shedding top layer. Both males and females can have two, four or even more horns, although occasionally females are polled (no horns). History: This primitive breed is descended from the multi-horn North European sheep, established in the UK many centuries ago. 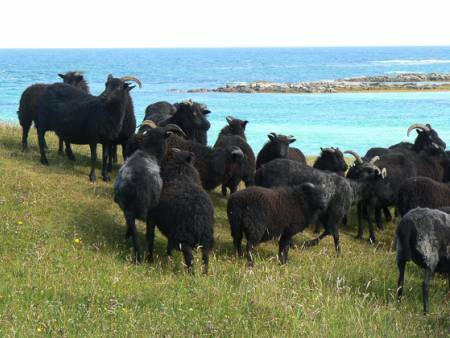 The Hebridean Sheep Society was established in 1994. Geography: While native to the western highlands and islands of Scotland, Hebridean sheep have survived to modern times in the parklands of country estates throughout the UK. Breed Attributes: These sheep are very hardy with strong hooves used to rocky and wet upland terrain. They thrive on rough extensive and conservation grazing. The females have strong mothering instincts and lambs are very lively from birth. Hebrideans have short tails that should not be docked. Commercial desirability: The Hebridean Sheep Society promotes the ability of females to rear twin lambs, even under less than ideal conditions, saying that when crossed with a meat-producing breed, lambs grow quickly and reach their mother’s weight in a few months. The society also upholds the effectiveness of the breed for conservation grazing on a variety of ecosystems. Appearance: Adult Herdwick sheep are distinctive for the sharp contrast between their white faces and legs and blue-grey fleece – yet lambs are born with black wool that changes colour as they mature. The breed is sturdy and strong-boned; males can have horns. History: The breed can trace its origins in the UK to the 12th century, but is thought to be a Scandinavian breed that was introduced much earlier than that when Viking invaders arrived in the eighth century. The name Herdwick is thought to derive from the Norse word 'sheep pasture’. The breed society was established in 1916. 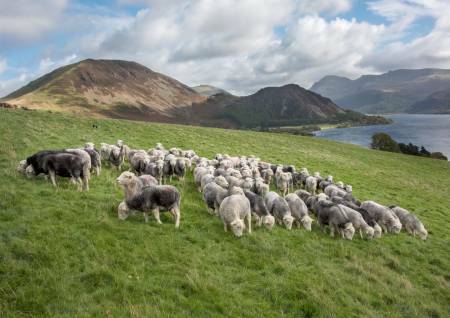 Geography: The developed breed that we know today originates from and continues to flourish in the Lake District of England, with few flocks found elsewhere in the UK. Breed attributes: Ideally suited to the upland terrain of the Lake District, the Herdwick is a hardy breed with a strong hefting ability. They are slow maturing but used to the wet and wild environment they live in. Commercial desirability: The Herdwick Sheep Breeders Association promotes the breed as an active, strong boned sheep of good conformation and the ability to thrive with little or no supplementary feeding. It has successfully developed marketing schemes linking meat from the breed to the iconic landscape it lives in. Appearance: The Hill Radnor is a strong, heavy boned sheep with grey nose and tan face. Its fleece is white and the males have curved horns that spiral outwards. History: The breed is thought to originate from the old Welsh tan-faced sheep of the Radnor Hills area of mid-Wales. It was first referenced in 1911 as native to the hills around Radnor, Hereford, Monmouthshire and Brecon. The Hill Radnor Flock Book Society was established in 1949. Geography: Recognised as a rare breed, the Hill Radnor has remained local to its origins on the England-Wales border of mid-Wales, found predominantly around the Brecon area. 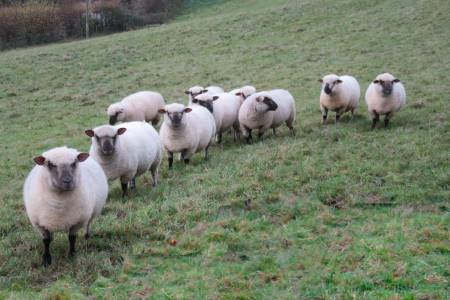 Breed attributes: This hardy hill breed will thrive in harsh conditions, with the females demonstrating excellent mothing ability and producing slow maturing lambs. Commercial desirability: The Hill Radnor Flock Book Society promotes the breed as a hill sheep with females that can produce 1.5 lambs per year in favourable conditions. They were historically reputable as good mutton producers. Appearance: With a white head and legs, the Ile de France is often noted for its think nose and lips. The fleece is white and close and both males and females are hornless. History: Developed at a French veterinary college in the 1830s through crosses of the Dishley Leicester and Rambouillet, the breed was originally known as the Dishley Merino. Once established as the Ile de France, it was first exported to the UK is the 1970s with a breed society established here in 1978. Geography: Native to the Ile de France region of Northern France, the breed is now found in South Africa, Australia, Europe and the Americas. It is kept in small numbers in the UK. 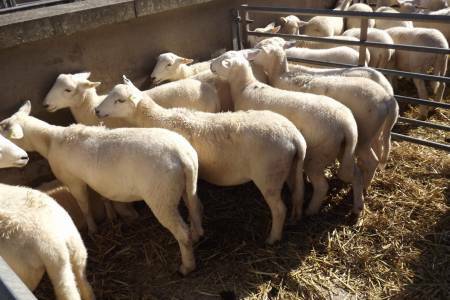 Breed attributes: A terminal sire breed developed for its ability to produce lambs suitable for the food chain, the Ile de France is hardy and suitable for intensive and extensive systems. 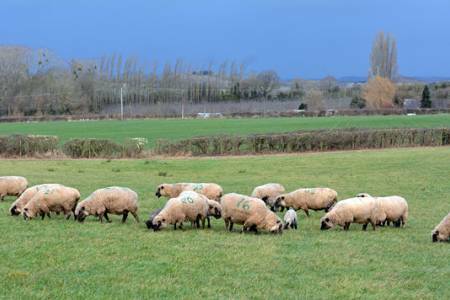 Commercial desirability: The Ile de France Sheep Society promotes the breed for its ability to improve breed meat production in other breeds when used as a crossing sire, with lambs being quick to finish. Appearance: The Jacob is distinctive for its white fleece with well-defined black or brown patches. Its head and neck are generally black with a white blaze from face to chest. Both males and females always have horns, but these can be two or four in number. History: It is believed that the Jacob acquired its colour pattern from the Middle Eastern breeds of Biblical times, and its horns from Viking stock. It was introduced to the UK from Spain in the 16th and 17th centuries as a fashionable and attractive parkland breed. The Jacob Sheep Society was established in 1969. Geography: From its origins as a parkland breed, the Jacob is now found all over the UK. 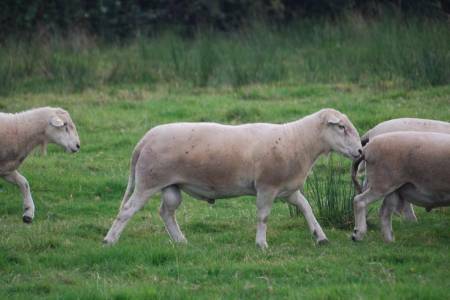 Breed attributes: The Jacob is a lowland breed yet has the ability to be out-wintered with females that are easy lambing with good mothering abilities. Commercial desirability: The Jacob Sheep Society promotes the breed as being hugely improved over the past 40 years, combining ease of management with good meat production. Appearance: With a proud stance and upright ears, the Kerry Hill is distinctive for the sharply defined black markings around the nose and eyes of its white face. Its dense fleece is white and the breed does not have horns. History: The breed originates from the village of Kerry in mid-Wales with records that can be traced back to this area of the England-Wales border from 1809. The Kerry Hill Flock Book Society was established in 1899. Geography: The Kerry Hill continues to have a strong following in its native area in the Welsh Borders and, with a resurgence in numbers in recent years, is also found in other parts of the UK, Ireland and Holland. Breed attributes: The breed is sturdy and adaptable to different lowland systems with maternal attributes that ensure good mothering ability in females. 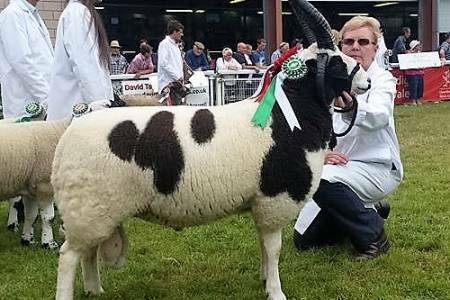 Commercial desirability: The Kerry Hill Flock Book Society is rightly proud of its achievement in halting falling numbers, saying it is thanks mainly to the striking appearance of the breed being attractive to smallholders. Appearance: The Llandovery Whiteface is a type of Welsh mountain sheep but developed to be a little larger in stature (length and depth). The breed has a clean white face and a dense white fleece. Males are sometimes horned. 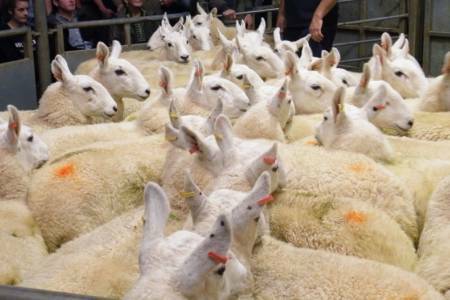 History: The breed has been bred for generations to thrive in the areas surrounding the Black Mountain of Carmarthenshire, with Llandovery Market being renowned for its autumn sales of breeding females. 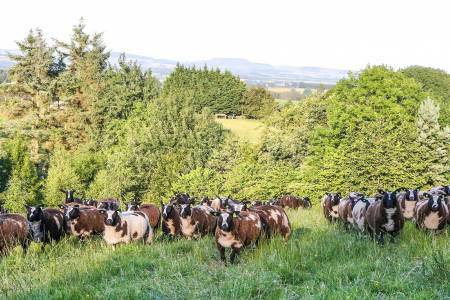 The Llandovery Whiteface Hill Sheep Society was established in 1998 a small number of local farmers wanting to progress the genetic development of the breed. Geography: Breeders of Llandovery Whiteface remain concentrated in the Llandovery area of Carmarthenshire, but demand for the breeding females comes from throughout Wales and beyond for production of Welsh Mules and Welsh Halfbreds. 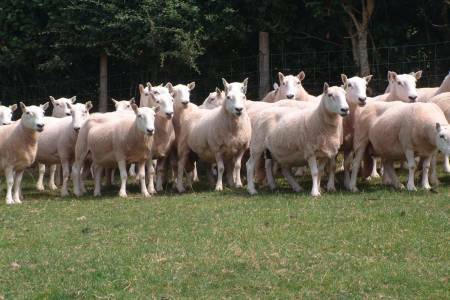 Breed attributes: Development of breed has focused on retaining the hardiness and maternal quality of the upland breed while improving conformation to ensure demand for females for breeding stock and lambs for the food chain. 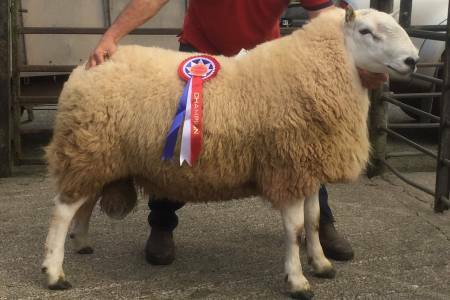 Commercial desirability: The Llandovery Whiteface Hill Sheep Society says its vision is to produce more high genetic merit males to produce lambs that will better meet market requirements, while maintaining the characteristics and mothering ability of the breed. 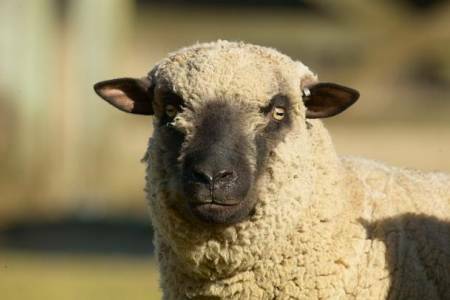 Appearance: A medium sized sheep with a black face made distinctive by a tuft of white wool on the forehead and slightly upright ears. The rest of the fleece is also white, and the legs black. History: The Llanwenog originated in the Teifi Valley of West Wales in the late 19th Century, developed from a mixture of several breeds including the Welsh Mountain, Clun Forest, Shropshire and now extinct Llanllwni. The Llanwenog Sheep Society was established in 1957. Geography: Recognised as a rare breed, Llanwenog sheep are found predominantly in the area of their origin of West Wales, with some specialist flocks found in other parts of the UK. Breed attributes: A hardy upland sheep but with the ability to produce more lambs than some hill breeds, usually rearing twins rather than a single. 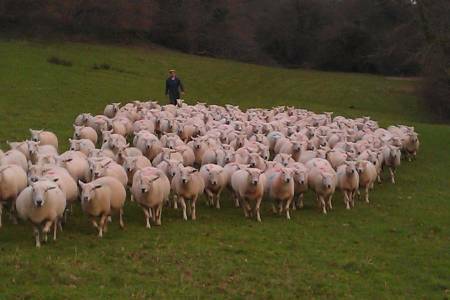 Commercial desirability: The Llanwenog Sheep Society promotes the breed as being easy to manage, versatile and prolific, producing a high quality and flavoured meat. Appearance: A medium-sized sheep, the Lleyn has white legs, a slender white head with a black nose, and a white fleece. The breed standard requires males and females to not have horns. 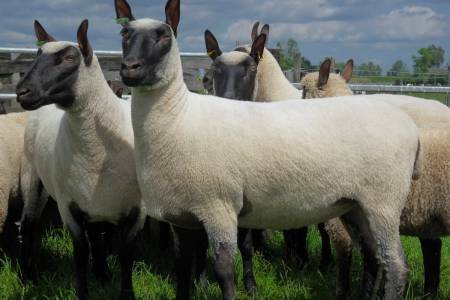 History: The origins of the Lleyn are in Ireland, where Dishley Leicesters brought from the UK were used to improve indigenous Irish sheep and develop the Roscommon breed. The Roscommon was exported to the Lleyn peninsula of North Wales in the early 19th century and used to improve local Welsh sheep into the Lleyn. The Lleyn breed society was formed in 1971. Geography: Originally bred to thrive on the Lleyn peninsula, the Lleyn did not find popularity until the mid-20th century, when it gained a reputation for being the fastest growing breed in the UK. It is now found in large numbers on farms throughout the UK, as well achieving some export success. Breed attributes: The Lleyn is desirable for its combination of low maintenance and prolificacy, meaning hard working mothers will easily rear two lambs at a time. As a maternal breed, it is a popular cross with terminal sire breeds to produce prime lambs for the food chain. 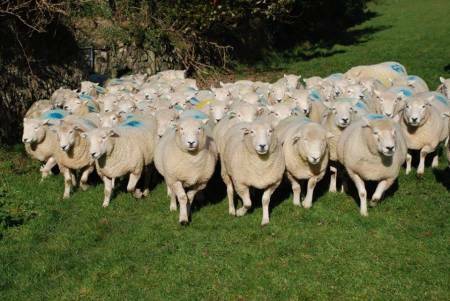 Commercial desirability: The Lleyn Sheep Society promotes the breed as low maintenance, low disease risk and efficient, with the ability to thrive on upland and lowland grazing. Appearance: The Lonk is one of the largest hill breeds native to the UK. It has mottled black and white legs and face, coupled with a white fleece. Both genders are horned. 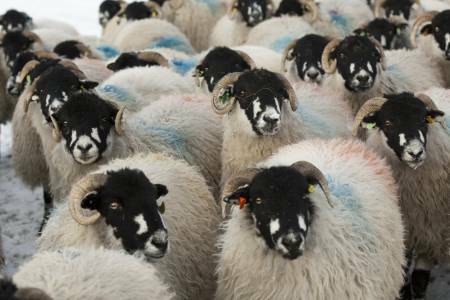 History: Bred on the Lancashire and Yorkshire Pennines, the breed can be traced back for several centuries with one existing flock having full records to 1740. The Lonk Sheep Breeders Association was established in 1905. Geography: The breed continues to be predominantly found in the Pennines where it originated. Breed attributes: A hardy hill breed, the Lonk has strong maternal characteristics and is able to withstand most climates. 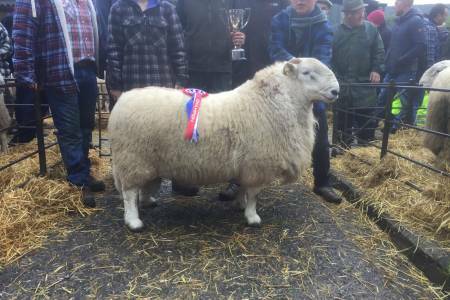 Commercial desirability: The Lonk Sheep Breeders Association promoted the breed as being strong boned and well woolled, producing lamb for the food chain with a good combination of fat to lean meat. 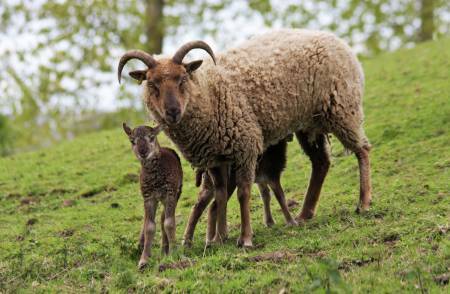 Appearance: With up to six horns that can grow to quite considerable length, the Manx Loaghtan is a distinctive sheep. 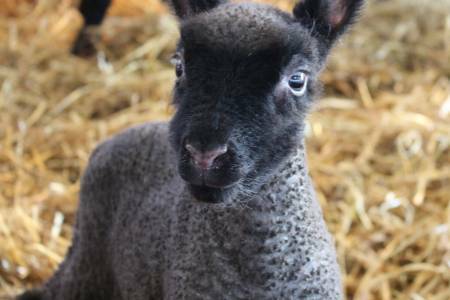 It has a brown face and legs and a dark brown fleece, although lambs are born black and change colour after two weeks. History: This primitive breed has uncertain origins as far back as the Iron Age, but is known to have grazing upland areas of the Isle of Man for more than 1,000 years. 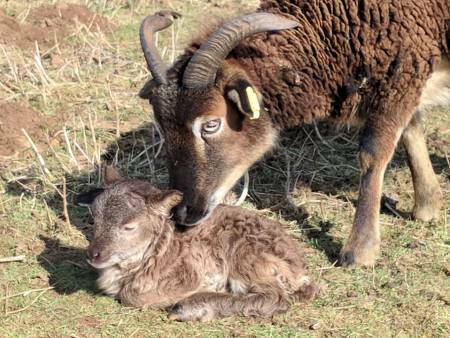 Geography: Recognised as a rare breed, the Manx Loaghtan continues to be found on the Isle of Man as well as other specialist flocks in the UK. Breed attributes: This small sheep suits extensive and conservation grazing as they will thrive on rough grazing while still being able to successfully demonstrate strong mothering skills and rear lambs. Commercial desirability: The Manx Loaghtan Sheep Breeders Group promotes the hardiness of the breed and ability to thrive without supplementary feeding. 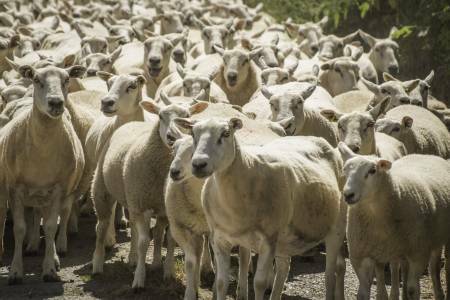 There is some anecdotal evidence showing good levels of resistance towards common sheep diseases and parasites, while some sheep of this breed will also naturally shed their fleeces in summer. Appearance: A medium-sized sheep, this breed has distinctive black and white markings on its face and legs and a long-stapled, white fleece. History: The Masham is a crossbred sheep so the mother is always a Dalesbred and the father is always a Teeswater. This specific cross was developed in the 20th century and the Masham Sheep Breeders Association established in 1986. Geography: Mashams continue to be found in the hills of Northern England, where the breed was first developed. 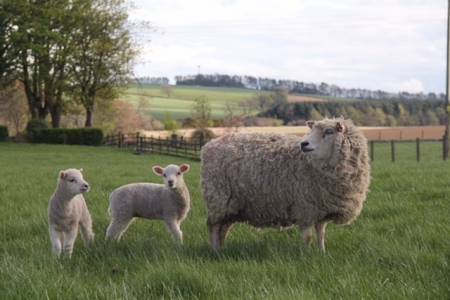 Breed attributes: Combining the strengths of both its parents, the Masham is a maternal, prolific breed that will rear twin lambs each year on marginal land. 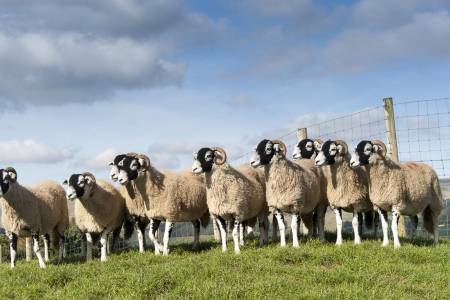 Commercial desirability: The Masham Sheep Breeders Association promotes the breed for its longevity, hardiness and milking ability, with the ability to adapt to a variety of management systems. 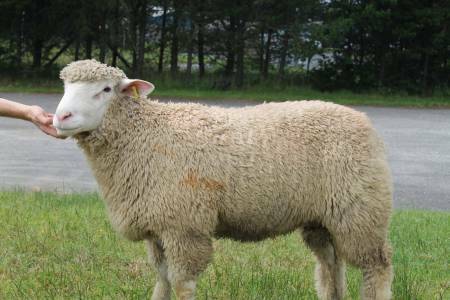 Appearance: Bred specifically for its commercial performance, this relatively large sheep breed has a white face and white, tight fleece. 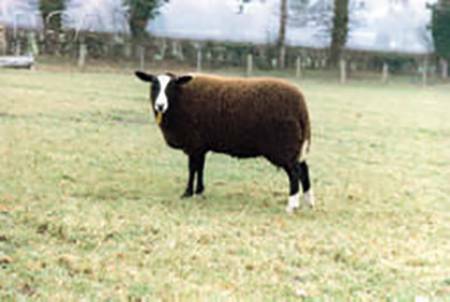 History: The Meatlinc is the result of a five-breed crossing programme in the 1960s, involving two British and three French sheep breeds to produce a composite breed through performance recording to select desirable commercial traits. 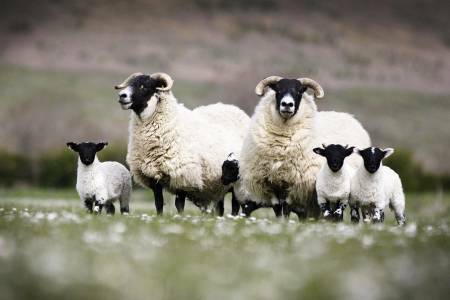 Geography: The original flock was developed in North Yorkshire, where the Meatlinc company is still based to supervise a small number of breeding flocks that supply stock to farms throughout the UK. 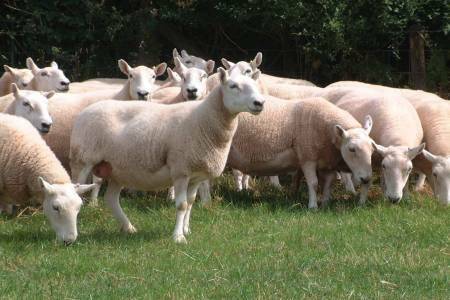 Breed attributes: The Meatlinc was developed as a terminal sire breed to produce hardy, fast-growing lambs with good conformation in a variety of lowland management systems. It has found favour amongst producers that want to buy breeding stock based on performance data. Commercial desirability: The Meatlinc company avoids calling itself a breed society and, focused on performance rather than appearance, does not permit stock to appear in show rings. It promotes the breed for its evidence-based performance credentials to enable producers to make a profit from supplying lambs into the food chain. Appearance: The Nelson South Wales Mountain is a type of Welsh mountain sheep, the largest within the range. It has a white fleece, often with a brown collar. The face is white or white with tan markings and the males are usually horned. 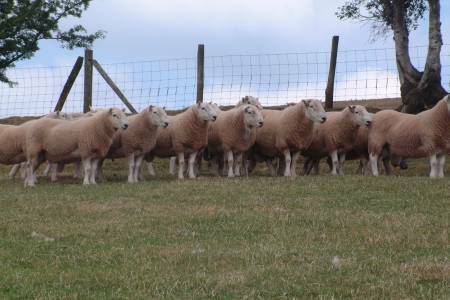 History: The breed is native to the hills of Glamorgan, Gwent and South Powys, developed during the 20th century. The Nelson South Wales Mountain Sheep Society was established in 1948. Geography: Remaining true to the origins of where it was first developed, the majority of flocks are found in South Wales. 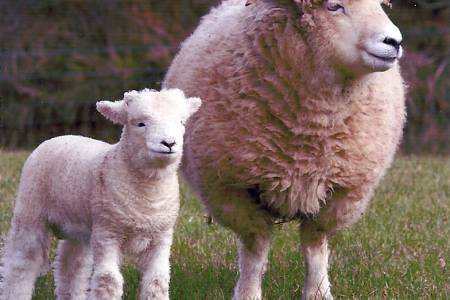 Breed attributes: A hardy, maternal hill breed, the Nelson South Wales Mountain thrives in harsh conditions, often averaging 1.5 lambs a year rather than just a single. Commercial desirability: The Nelson South Wales Mountain Sheep Society promotes the breed as sustainable, efficient, profitable and resilient. 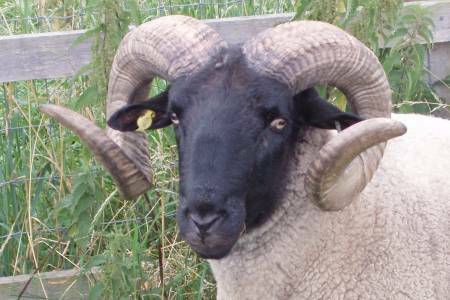 Appearance: A medium-sized, sturdy breed, the Norfolk Horn has a black face and legs and white fleece. The wool on new born lambs is always darker or can be mottled, changing to white with age. Both males and females have horns with an open spiral. History: The Norfolk Horn is thought to be one of the oldest breeds in Britain, descended from the ancient Saxon black faced sheep once prevalent in northern Europe and established in the UK in the 13th century. The Norfolk Horn Breeders Group was established in 1994. Geography: Having been developed in the relative isolation of East Anglia, the breed tends to be found in Norfolk, Suffolk, North Essex and South East Cambridgeshire. It is recognised as a rare breed. Breed attributes: It is a lowland breed but with the ability to thrive on sparse vegetation and in dry, cold conditions, making it suitable for conservation grazing. 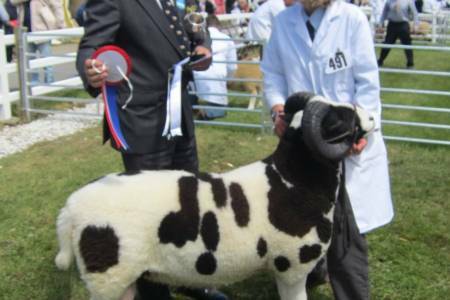 Commercial desirability: The Norfolk Horn Breeders Group promotes the breed as having good mothering ability and the ability to rear relatively quick-growing lambs, making it a suitable terminal dam breed. It emphasises the Norfolk Horn’s excellent foraging characteristics. Appearance: Within the range of Cheviot sheep breeds, there are three types of North County Cheviot – the Caithness, Hill and Border. All three are at the larger end of the size scale for the Cheviot and for hill sheep in general. They have a distinctive and alert white face, plus white legs and a reasonably long white fleece. History: The North Country Cheviot evolved from an animal first taken to Caithness at the top of the Scottish mainland in the 18th century. The Caithness type was developed on the fertile land here as a bigger, heavier type of sheep. The Hill type of North Country Cheviot is slightly smaller, being development on the harder and more rugged hill country of Sutherland, while an infusion of bloodlines from Cheviots traditionally found in the Scottish Borders resulted in the Border type of North County Cheviot. The breed society for all three types was established in 1945. 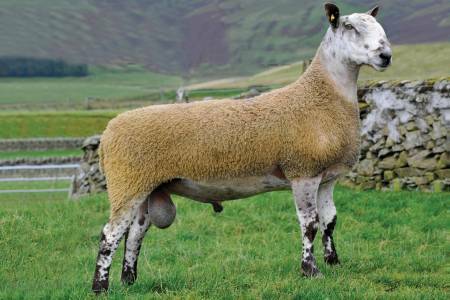 Geography: Having been developed in specific areas of Scotland, the North Country Cheviot continues to be found here, but is popular with breeders in many other parts of the UK and overseas. 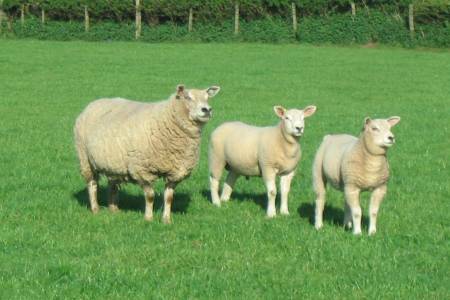 Breed attributes: This hardy hill breed is crossed to produce commercial crossbred and Mule-type breeding females as often as it is kept pure, always retaining its maternal abilities Purebred and crossbred lambs are commercially desirable for the food chain. Commercial desirability: The breed society promotes it as being notable for consistency, reliability and versatility. Appearance: A medium sized sheep with a black and white mottled face and legs and a white fleece. History: As the name suggests, the North of England Mule is a crossbred sheep. The father is always a Bluefaced Leicester and the mother is either a Hexham Blackface or a Swaledale. This cross was developed in the 20th century and the North of England Mule Sheep Association established in 1980. 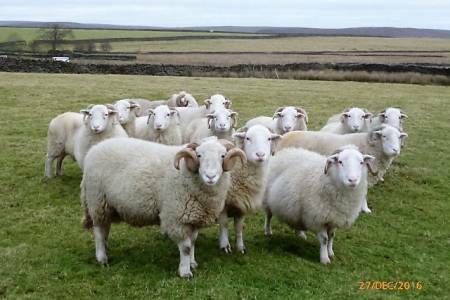 Geography: This breed is produced on the upland and hill farms of Northern England and sold to a large number of lowland farms throughout the UK. It is considered the most numerous type of Mule in the UK. Breed attributes: The females of this breed combine the prolificacy and milkiness of their sire with the hardiness and longevity of their dam, making them sought-after mothers to be crossed with a terminal sire breed and produce fast-growing lambs for the food chain. Commercial desirability: The North of England Mule Sheep Association promotes the breed as a ‘top class mother of prime meat lambs’, emphasising the hybrid vigour it gains from being a Mule, its ability to breed in its first year, ease of shepherding and renown for production of quality lambs. Appearance: The Oxford Down is the largest and heaviest of the Down breeds. It is a bold, large-framed, upstanding sheep, with blocky conformation and a broad, deep body of good length. The poll is well covered with wool, and adorned by a ‘top-knot’ and the face is a uniform dark colour. History: The breed was developed in and around Witney, Oxfordshire, as a result of crossing Cotswold males with Hampshire Down and Southdown females in the 1830s. The Oxford Down Sheep Breeders Association was established in 1889. Geography: Oxford Down flocks are found throughout the British Isles with a concentration in the Midlands. 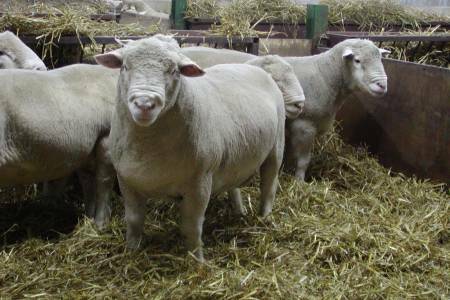 Breed attributes: Oxford Downs are noted for fast growth and early maturity. Oxford lamb has excellent eating quality, with flavour and tenderness greatly enhanced by a degree of marbling. Oxford ewes will naturally breed early in the season and are generally good lambers with a strong maternal instinct. The breed is hardy and healthy, with scrapie virtually unknown, and has very good, hard feet. Oxfords clip a heavy fleece producing wool of close texture, good staple and fine quality. 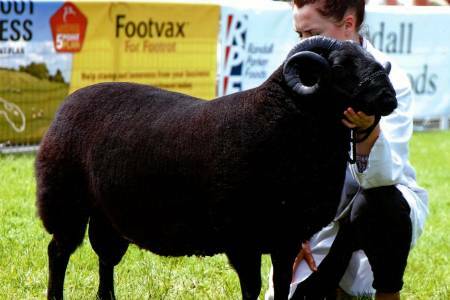 Commercial desirability: The Oxford Down Sheep Breeders Association promotes strong and bold sheep, stating that when used as a terminal sire on any commercial ewe breed or cross, the Oxford ram will produce high quality, hardy, fast-growing lambs that are easily finished off grass alone. Oxford cross lambs have an outstanding capacity for early maturity and will typically produce 18-22kg carcases at 12-16 weeks. Alternatively, lambs can be kept on to heavier weights (22-25kg) without excess fat, producing high quality large, lean lambs or heavy hoggs. 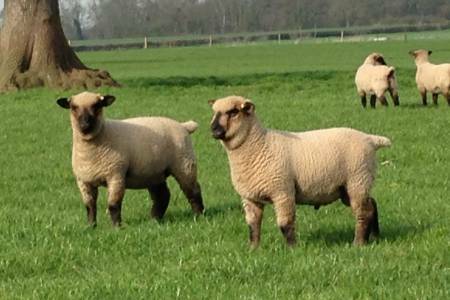 Oxford cross lambs are vigorous and active at birth and display considerable hardiness due to their good wool cover from birth and good birthweight. 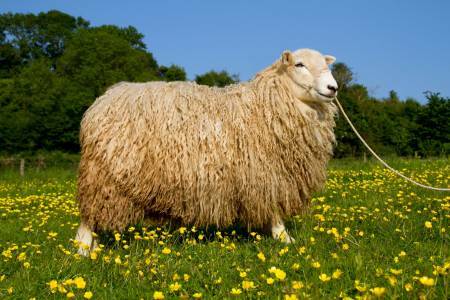 Appearance: This large, long-woolled breed has a broad white face, a woolly ‘top-knot’ and heavy, white fleece. Both males and females are without horns. History: The breed originated in the Romney Marshes of Kent and Sussex in South East England in the 13th century. It was known as the Kent sheep as it expanded over the rest of South East England, with the name Romney adopted as it grew in popularity around the world. The UK breed society was established in 1895. Geography: The traditional UK Romney remains true to its origins in South East England, but the breed has been developed in many directions around the world and, with the vast sheep industries of New Zealand and other countries having their origins in the Romney, is sometimes referred to as the best known sheep in the world. Breed attributes: The exposed, isolated nature of the Romney Marshes resulted in this breed being hardy, requiring minimum management and excellent foragers. It produces prime lambs for the food chain as well as large fleece suitable for carpets. Commercial desirability: The Romney Sheep Breeders Society promotes the breed as being independent with a strong constitution and adaptability. The breed has a reputation for sustaining good health even when kept at high stocking densities. Appearance: The French word for red is part of the name for this breed because of the distinctive red/pink skin seen on the head, legs and underbelly of Rouge de L’Ouest sheep. 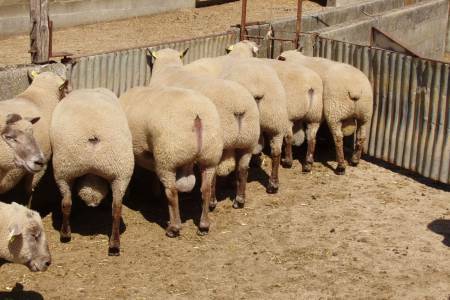 Sheep are large framed, polled and well-muscled. History: Literally translating as ‘red of the west’, the breed was developed in the Loire Valley of Western France by crossing blue faced Wensleydale rams with local Landrace sheep in the 19th century to produce dairy sheep for Camembert cheese production. The breed arrived in Britain in the 1980s with a breed society established in 1986. Geography: The Rouge de L'Ouest continues to be popular in France, with the specific British Rouge found in specialist flocks in the UK. 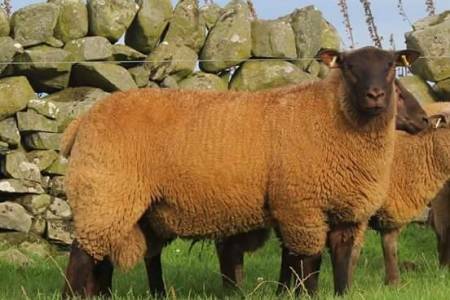 Breed attributes: A long way from its origins as a dairy breed, the British Rouge is known as a terminal sire breed with prolific, milky ewes rearing early-maturing prime lambs for the food chain. Commercial desirability: The British Rouge Sheep Society promotes the breed as being good for breeding stock and prime lamb production, having ‘meat in all the right places’. 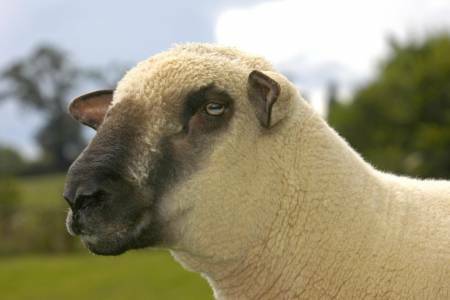 Appearance: A large, strong-framed sheep with a black head and definite white patch on the nose. The fleece is white and rams have large horns. 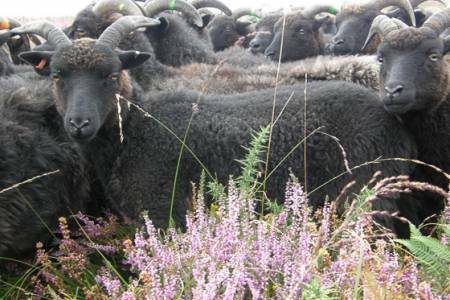 History: The Rough Fell is a derivative of the horned black-faced heath sheep found in Northern Britain in the Middle Ages. It was developed following crossings with now extinct breeds in that area. 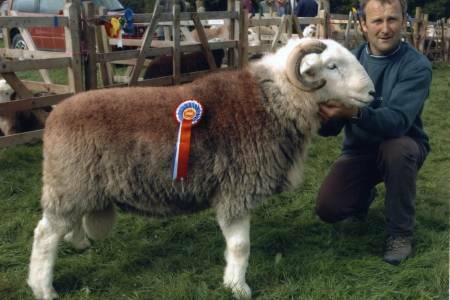 The Rough Fell Sheep Breeders Association was established in 1926. Geography: Native to the Westmorland area of Cumbria and the North West corner of the Yorkshire Dales, the Rough Fell continues to predominantly found in this area of the Northern Pennines. Breed attributes: As one of the largest types of native UK hill breed, Rough Fell females are hardy sheep well suited to rearing good-sized lambs suitable for the food chain. They also produce a heavy fleece used in carpet manufacture. There is a good following for Rough Fell Mules, which are Rough Fell females crossed to the Bluefaced Leicester male. 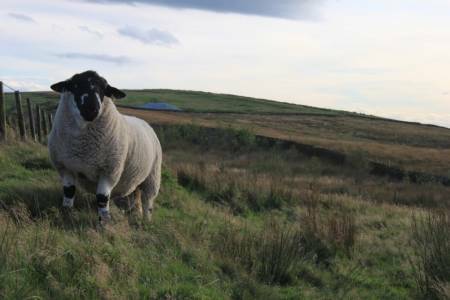 Commercial desirability: The Rough Fell Sheep Breeders Association promotes the breed as well suited to the hardships of exposed and high upland mountains, due to her strength, hardy constitution and ability to rear lambs from poor upland grasses and heathers. Appearance: A medium-sized sheep with white wool and brown face and legs. 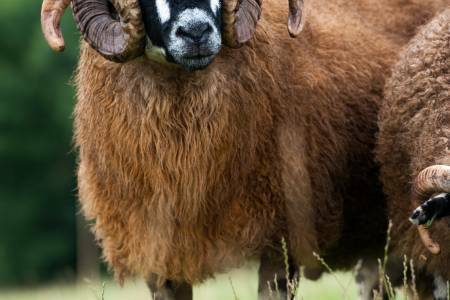 History: The original Roussin was developed by crossing local breeds of the moors and dunes of Northern France with two breeds from the UK – Dishley Leicesters and Southdowns. The resulting breed was first imported to the UK in 1989. Geography: Roussin sheep continue to be found in France, with the specific British Roussin found in small numbers in the UK. Breed attributes: A multifunctional breed that is capable of adapting to many farming systems, in particular systems in coastal areas. Pure sheep are milky, prolific animals that produce a good lengthy carcase lamb. 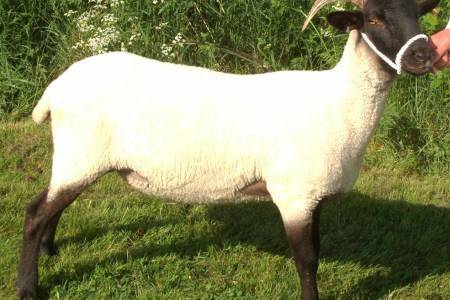 These qualities are also passed to cross bred females making the Roussin an excellent choice for either pedigree or commercial breeding. 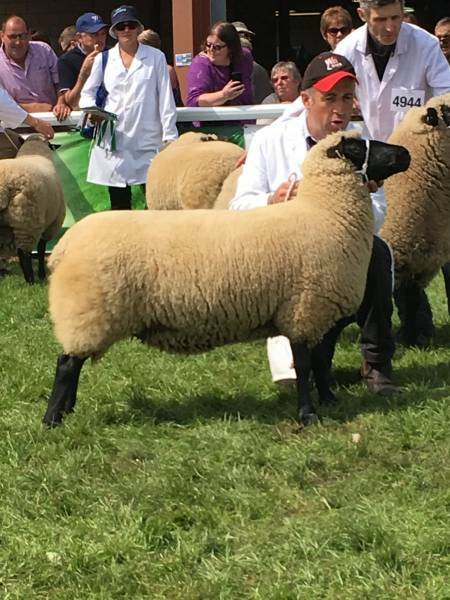 Commercial desirability: The British Roussin Sheep Society promotes the breed as being suitable for early lambing flocks, as rams will work out of season. They are also the ideal choice of lambing hoggs as their lambs are easy to lamb, have immense vigour and grow away quickly. The Roussin passes on good carcase conformation to it’s offspring and enables commercial producers to hit the market specifications consistently. Appearance: The Ryeland is notable for the fact its wool grows right around its face and most of the way down its legs. It is compact and stocky. The dense fleece is usually white but a growing number of breeders are specialising in Coloured Ryelands. History: The breed was developed by monks in Leominster, Herefordshire, in the 12th century, using the Spanish Merino as the base. The Ryeland Flock Book Society was established in 1903. 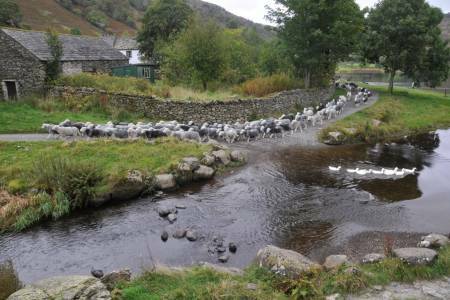 Geography: The Ryeland is found is many lowland areas of the UK, finding huge popularity with smallholders in more recent years. 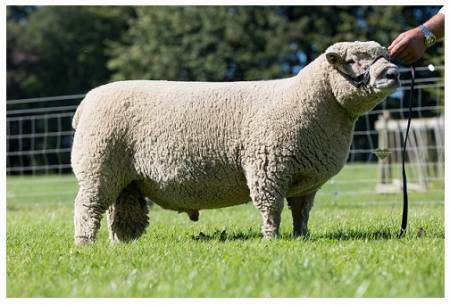 Breed attributes: As a solid sheep that is medium in size, the Ryeland’s docility means it is easy to handle and manage yet able to produce quality lambs for the food chain in a variety of different systems. 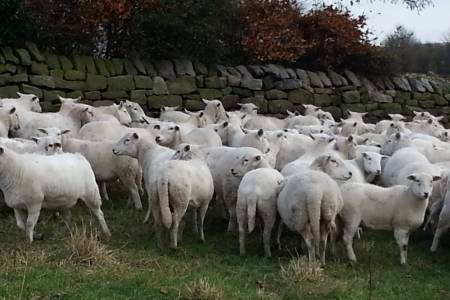 Commercial desirability: The Ryeland Flock Book Society promotes the breed as docile and amenable with a ready market amongst native breed butchers for quality meat and hand spinners and weavers for textured wool. Appearance: A medium sized sheep with a black and white mottled face and legs and a thick, creamy white fleece. History: As the name suggests, the Scotch Mule is a crossbred breed sheep. Its father is always a Bluefaced Leicester and the mother a Blackface ewe. The combination is thought to have been developed in the mid-20th century but was recognised as a breed in the 1980s, with the Scotch Mule Association established in 1986. Geography: This breed is produced on the upland and hill farms of Scotland and Northern England and sold to lowland farms throughout the UK. Breed attributes: The females of this breed combine the prolificacy and milky of their sire with the hardiness and adaptability of their dam. This combination makes for excellent mothering ability to produce lambs for the food chain sired by a terminal sire. Commercial desirability: The Scotch Mule Association promotes the breed as offering something over and above other Mule breeds as a commercial breeding ewe capable of producing many lambs and rear them for the early market or later finishing from grass. Appearance: The Shetland is one of the smallest of native UK breeds but one of the most versatile. Their high quality fleece comes in 11 main whole colours, from white, to black, brown and grey, and 30 recognised markings. Both genders can have horns, but it is more common in males than females. Geography: Shetland sheep continue to thrive on the islands, under the supervision of the Shetland Flock Book Trust since its creation in 1927. 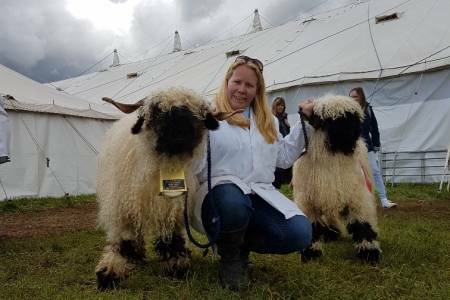 The breed is also found throughout the UK, with the Shetland Sheep Society established in 1985 to conserve the breed away from its native home. Commercial desirability: The Shetland Sheep Society promotes the breed as producing very high quality lean meat with outstanding flavour and fine texture. When crossed with a suitable terminal sire the heavier, faster maturing lamb is readily acceptable at markets. Appearance: Shropshire sheep are medium in size with a black face and legs with a dense white fleece growing up over the forehead. Black ear protruding from the side of the head give the breed an alert appearance. History: The breed was developed in the 19th century by crossing various local breeds in the Shropshire and North Staffordshire area, including the small, black-faced Long Mynd and the sheep of Morfe Common. 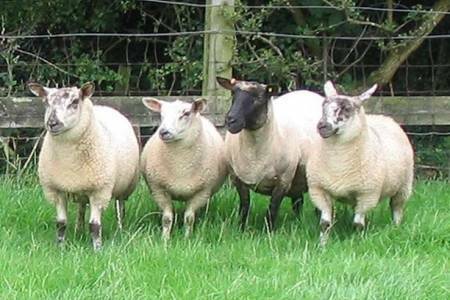 The Shropshire Sheep Breeders Association was established in 1882 and is claimed to be the oldest in the UK. Geography: From an early stage in the history of the breed, Shropshires were exported to North America and the colonies. In more recent years, the breed has established a new European profile in Austria, Belgium, Denmark, France, Germany, Ireland and Switzerland – as well as having various breed enthusiasts throughout the UK. Breed attributes: A lowland breed but with the ability to also thrive on more extreme terrain in high rainfall areas. Shropshire females with good mothering abilities can lamb early (before Christmas) to produce strong, high quality lambs for the food chain. 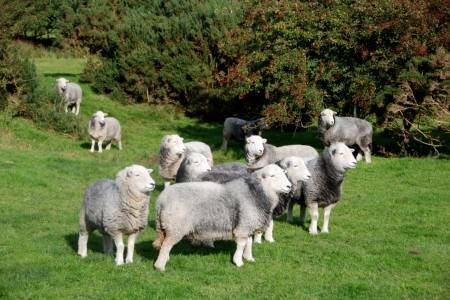 Commercial desirability: The Shropshire Sheep Breeders Association promotes the ewes as docile, long-lived and relatively easy-care, with the lambs combing fast growth off grass with high meat yield. It also publicises the breed as ‘tree safe’, meaning it will happily graze orchards, plantations and vineyards without eating or damaging trees, often acting as an eco-friendly and cost-effective weed suppressant. Appearance: This small, fine-boned sheep has a brown coloured face and fleece that varies in shades from very light to very dark. The fleece also varies in quality, from soft fine wool to coarse hairy fibres and mixtures in between. 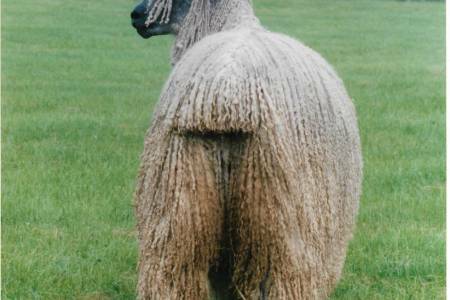 It has a naturally short tail and usually sheds its fleece in summer. Males typically have four horns and females have two or none. History: Soay sheep are the most primitive of all UK breeds, thought to have been established in the UK in the first century. They originate from a short-tailed breed originating in Northern Europe from prehistoric times, but it is unclear how they ended up on the island of Soay in the Outer Hebrides of Scotland. 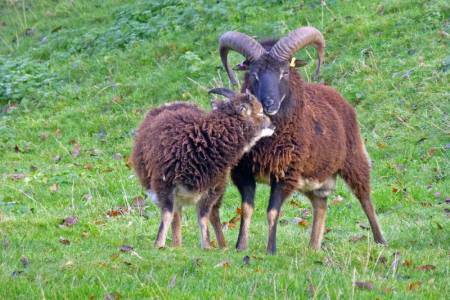 The breed society was established in 2000 and became the Soay & Boreray Sheep Society in 2003. Geography: Soay is one of four islands of St Kilda, the most westerly archipelago of the Outer Hebrides of Scotland. Having originated there, the breed is now found in small numbers with breed enthusiasts around the UK. It is recognised as a rare breed, but numbers are greater than that of the Boreray sheep that also originated in St Kilda. 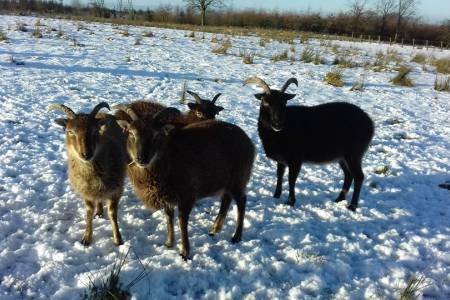 Breed attributes: Bred in the extreme environment of the Outer Hebrides, the Soay is a hardy upland breed that will thrive on harsh grazing in most conditions. This makes it suitable for conservation grazing schemes. 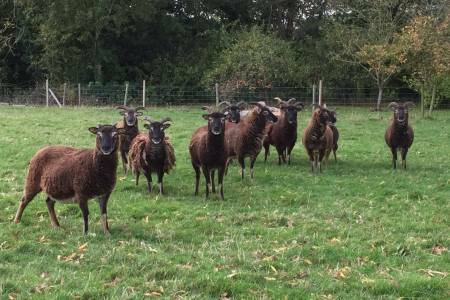 Commercial desirability: The Soay & Boreray Sheep Society promotes the breed as intelligent and nimble with excellent mothering ability and good resistance to health problems. 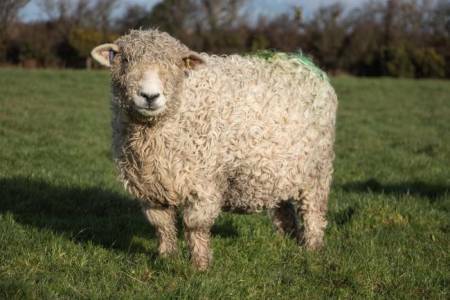 Appearance: Smaller than some of the other downland breeds found in the UK, the Southdown has fine textured white wool over its face, small ears and short legs. It is well fleshed with a wide back. History: The breed was established in the South Downs of Southern England before the 17th century but developed into the sheep we recognise today in the 18th century. It is claimed to be the oldest terminal sire breed in the UK with a part in the development of other terminal sire breeds in the UK and overseas. The Southdown Sheep Society was established in 1893. Geography: South East England continues to be the heartland for this breed, although it is also found in other parts of the UK, as well as France, Australia, New Zealand and America. 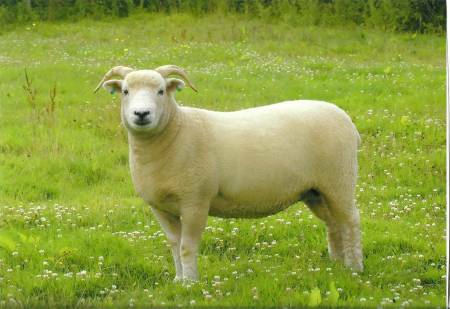 Breed attributes: The Southdown is used to product quality lambs for the food chain, be they crossbred or pure. It has seen a revival in the early 21st century due to the focus of breeders on maximising its commercial attributes. 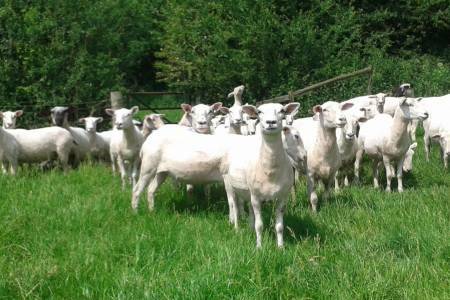 Commercial desirability: The Southdown Sheep Society promotes the females as easy-to-lamb, docile and suitable for a range of farming systems, while their offspring are easy to take through to a size and conformation suitable for commercial marketplace. Appearance: The Suffolk is distinctive for its completely black face and downturned ears. The legs, also black, stand out against the single colour of its dense, white fleece. 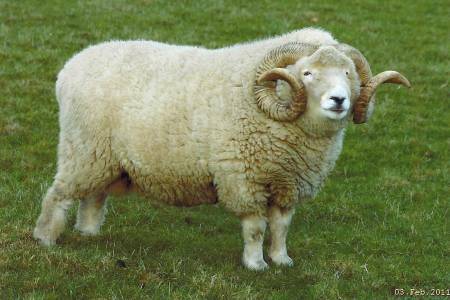 History: The breed became established in its own right in 1810, having been developed by crossing Southdown rams and Norfolk Horn ewes in the Bury St Edmunds area of Suffolk, England. Suffolk Show in 1859 was the first to have competitive classes for the breed, with the Suffolk Sheep Society established in 1887. Geography: From its origins in Eastern England, the Suffolk became the dominant terminal sire breed in the UK and is still the most used native terminal sire breed today. The Suffolk Sheep Society represents flocks throughout Europe and has seen the breed become know around the world, including in the USA, New Zealand and Australia. 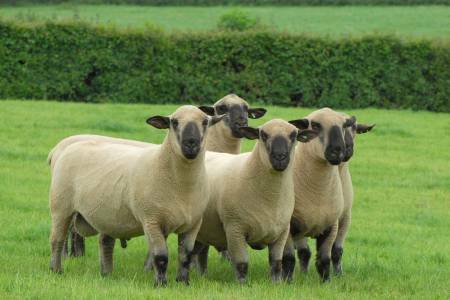 Breed attributes: As a large, lowland, terminal sire breed, the Suffolk’s purpose is to produce quality lambs with good conformation and growth rates, both crossbred and pure, for the food chain. 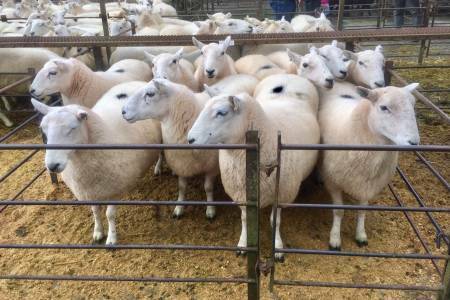 Commercial desirability: The Suffolk Sheep Society emphasises the fast-growing nature of its crossbred and purebred lambs, meaning they can be ready for market earlier, resulting in reduced input costs. It markets the females as having high milk output, hard hooves and easy lambing traits. 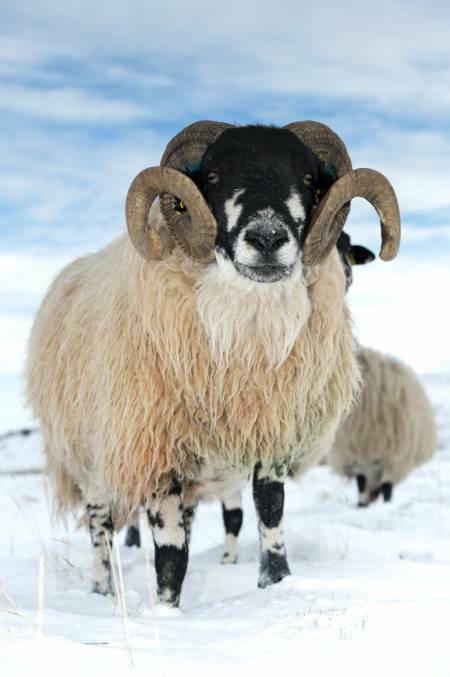 Appearance: The Swaledale has a black face with a white muzzle and white markings around its eyes. 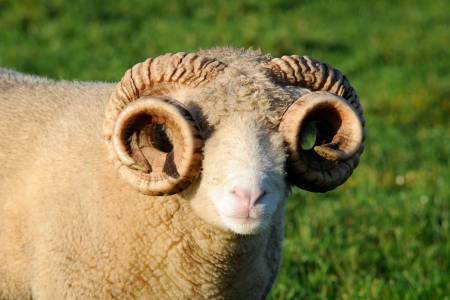 Both ewes and rams have a set of low, round, wide horns. The fleece is coarse and varies in colour from white to grey. History: The Swaledale is thought to have originated in the UK in the 12th century and is from the same genetic umbrella as other horned sheep, such as the Blackface and Rough Fell. It was developed into the breed we recognise today in the 20th century with the breed society established in 1920. Geography: Swaledale is one of the most northerly dales of the Yorkshire Dales in England. 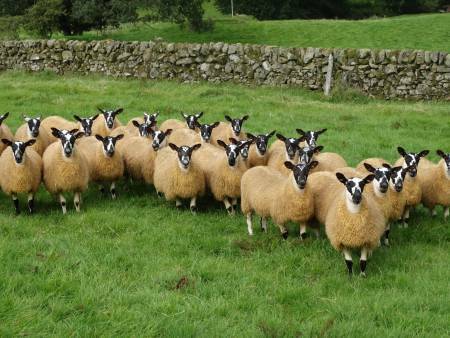 The Swaledale breed was developed here and in what was then Westmorland but became Cumbria. It is now found across the hills and moorlands of Northern England. Breed attributes: As a maternal hill breed, the Swaledale is hardy sheep and the females are excellent mothers and good foragers. 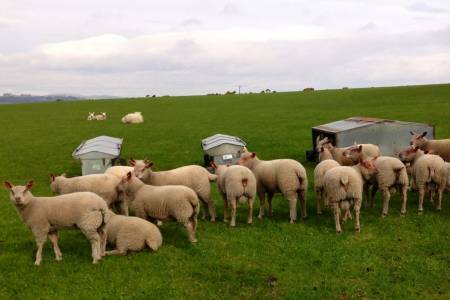 This means that can rear lambs on sparse grazing and in exposed environments. 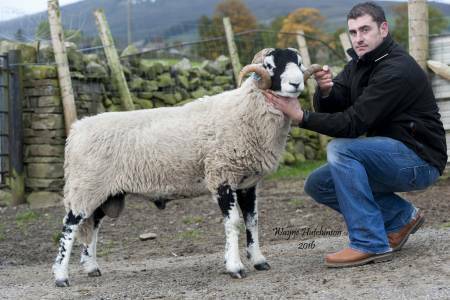 Commercial desirability: The Swaledale Sheep Breeders Association promotes the breed as bold, hardy and well fitted to endure the hardships of exposed and high lying situations. It claims huge distribution throughout the UK, both as a purebred sheep and as the dam of the hugely popular North of England Mule. Appearance: One of the larger types of Welsh mountain sheep, the Talybont Welsh has a white face and legs, sometimes with a touch of red tan. The fleece is white with a brown ruff and rams can be horned or polled. History: The Talybont Welsh was developed around the mountainous regions flanking the Usk valley, on the Brecon Beacons, Llangynidr Mountain and the Black Mountains. 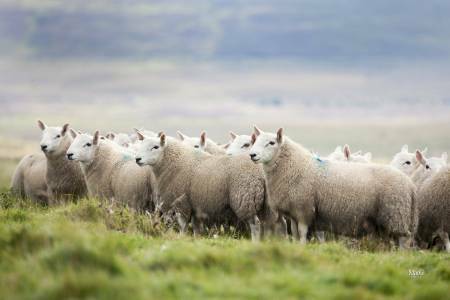 Geography: With its heartland in the Talybont area where it originated, this breed also see demand throughout other parts of Wales and the border counties. Breed attributes: As a maternal hill breed, the females are hardy with excellent mothering skills in harsh environments. The males have been bred to ensure size within the breed, increasing the weight of prime lambs when the breed is kept pure. 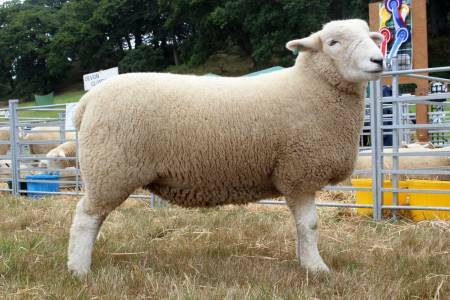 Commercial desirability: The Talybont Welsh Sheep Society promotes the breed for its maternal qualities when crossed and terminal sire qualities when kept pure, with lambs being heavier than other types of purebred Welsh mountain sheep. Appearance: A large, long-woolled breed, the Teeswater has a white or greyish blue face with dark markings around the nose and ears. It has a characteristic topknot of fleece falling over its face. 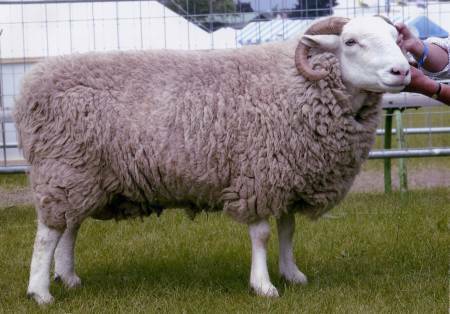 History: Native to the Teesdale area of County Durham in England, this breed was improved in the 19th century and became known as the sire of the Masham breed. The Teeswater Sheep Breeders Association was established in 1949. Geography: Having remained relatively localised to Teesdale until the 1920s, its involvement with the Masham breed saw it spread within Northern England. Recognised now as a rare breed, it continues to be found mostly in North East England. Breed attributes: A large, prolific sheep with a fine, long-stapled fleece, the Teeswater is reasonably hardy and able to produce medium-sized lambs in a variety of conditions. Commercial desirability: The Teeswater Sheep Breeders Association promotes the breed as a distinctively different longwool breed, suitable to harsher climates and, therefore, vital as a crossing sire to produce Masham that carry the best characteristics of the Teeswater of share, prolificacy and mothering ability. Appearance: The Texel is a white, hornless breed with a broad head, white face and jet black nose. It is a medium-sized, has a long rectangular body and well pronounced muscles. History: The breed can be traced back to Roman times and originated on the island of Texel on the north west coast of Holland. 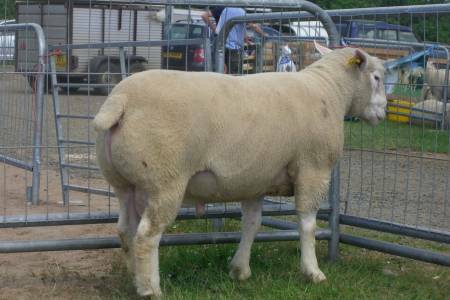 It was first imported into the UK in the 1970s, with the Texel Breed Society established in 1974. 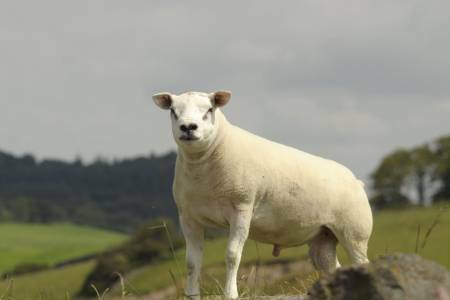 Geography: The Texel has become increasingly dominant in the UK since its arrival, challenging both native terminal sire breeds and other imports from the continent. It is also well known in the rest of Europe, Australia, Africa and South America. 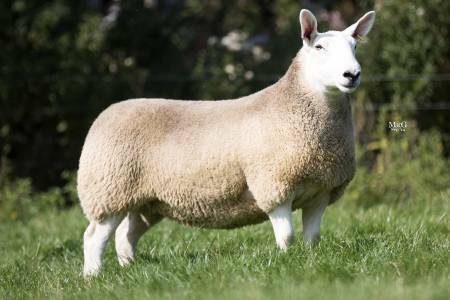 Breed attributes: As a terminal sire breed bred to produce lambs for the food chain, the Texel combines pronounced muscling, a long loin and lean meat. 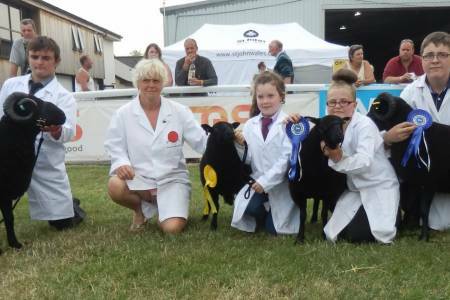 It made its mark in the UK as a crossing sire on native UK breeds, but Texel Mule and Texel cross females are increasingly popular as breeding females. 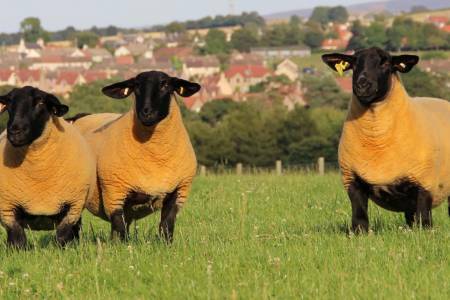 Commercial desirability: The Texel Sheep Society promotes the breed for its suitability for efficient prime lamb production in a variety of lowland and harsher environments, with fast growing lambs that stay lean. 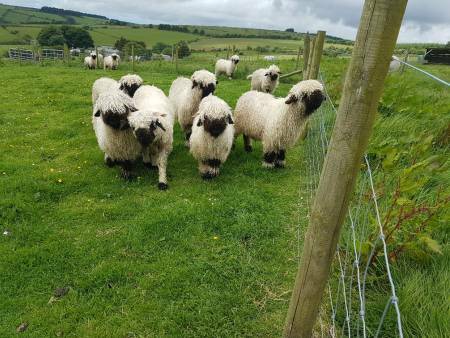 Appearance: The Valais Blacknose has a distinctive appearance, easily recognisable by the dark, black patches on its nose, eyes, ears, knees, hocks and feet but otherwise lightweight white fleece. 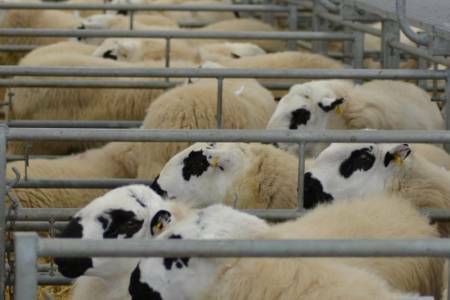 Both ewes and rams are horned and can reach typical weights of 70 – 90kg and 80 – 130kg respectively. Geography: The breed originates from the Upper Valais region of Switzerland, where the majority of flocks still remain. Breed attributes: The Valais Blacknose is a dual-purpose breed, raised both for meat and for wool. It is a large but docile breed that is well suited to the mountainous regions it originates from. Commercial desirability: The Valais Blacknose Society promotes the breed as dual purpose. Appearance: Vendeen sheep have wool on their head and cheeks. Their faces are brown with a long nose and broad muzzle, while fleeces are light in colour. 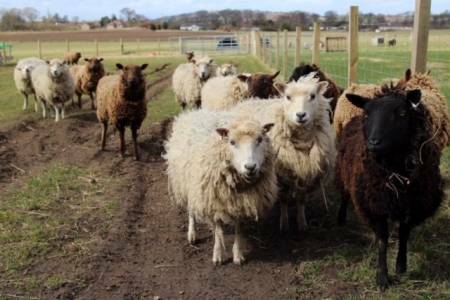 History: The origins of Vendeens are thought to go back to the Spanish Armada, when sheep were saved from the wreckage of the ships. 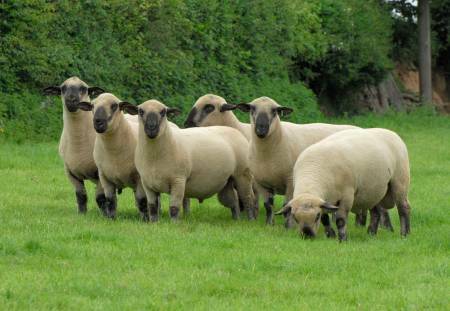 The breed was further developed by the introduction of Southdown genes in the 19th century and a breed society was established in the UK in 1982. Geography: The breed has been known to the Vendee region of Western France for many hundreds of years, with the specific British Vendeen developed in the UK since the first animals were imported in 1981. 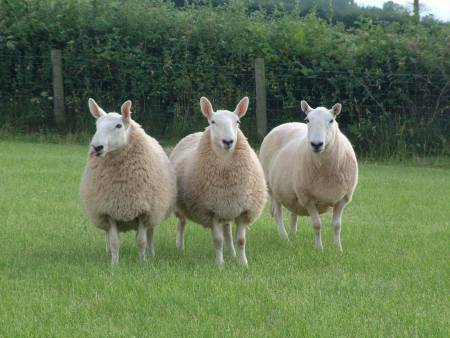 Breed attributes: A terminal sire breed with females that are prolific and easy lambing. Pure and crossbred lambs produce quality, lean meat for the food chain. Commercial desirability: The British Vendeen Sheep Society promotes the breed on its popularity as a commercial breed in France, offering easy management in a variety of different management systems. 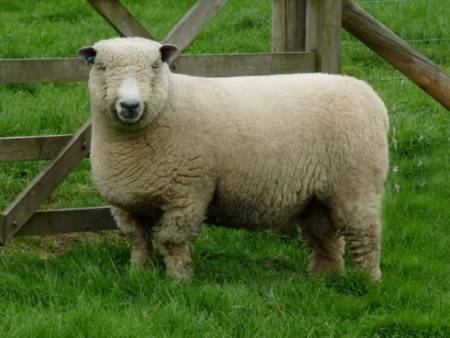 Appearance: The colour of the face and legs of the Welsh Halfbred can vary in colour from white to light tan, but the fleece is always thick and white. 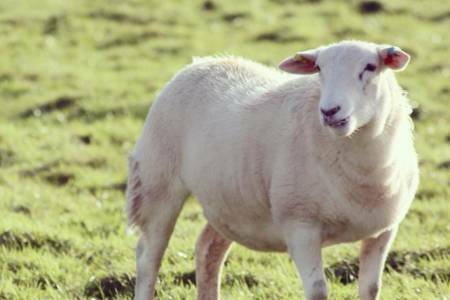 History: As the name suggests, the Welsh Halfbred is a crossbred sheep. The father is always a Border Leicester and the mother a type of Welsh mountain. Records show the cross existed from the early 1900s but it was not until it became a lifeline to farmers whose draft Welsh ewes were losing lowland buyers post-war that it became recognised as a breed in its own right and, in 1955, the Welsh Halfbred Sheep Breeders Association was established. Geography: Popular within Wales, with some interest from other parts of the UK too. Breed attributes: The Welsh Halfbred inherits hardiness, milkiness and good foraging ability from its hill-bred Welsh dam, and conformation and prolificacy from the Border Leicester sire. It is adaptable to upland and lowland conditions, producing lambs that will grow on grass without supplementary feeding. 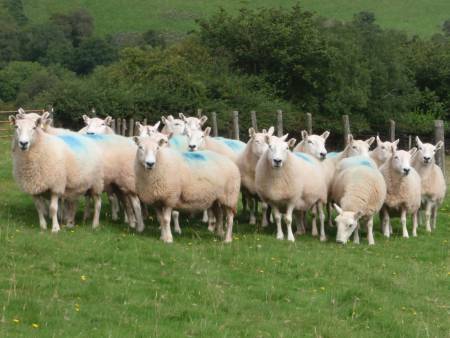 Commercial desirability: The Welsh Halfbred Sheep Breeders Association says the females may not be the biggest or have the highest lambing percentage but are an economical producer of quality lambs on upland and lowland farms. Appearance: As its name would suggest, the Welsh Hill Speckled Face has a white face with a black muzzle and black markings around the eyes and ears. The legs are mainly white but with black markings on the front knees, feet and back of the hind legs. Breeder selection means only 10% of rams now have horns, while females are always without horns. History: The breed is thought to have been developed in the hills of central Wales by crossing Kerry Hill and Welsh mountain sheep during the 20th century, later becoming popular over a wider area of upland Wales. 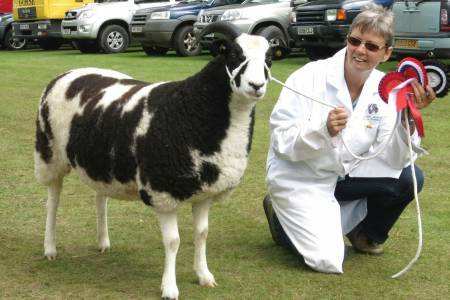 The Welsh Hill Speckled Face Sheep Society was established in 1969. 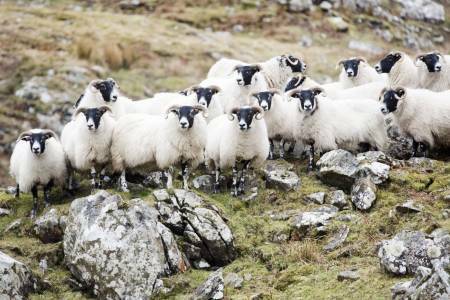 Geography: Welsh Hill Speckled Face sheep continue to be found predominantly in mid-Wales, with other notable pockets found further afield, especially in North Wales. Breed attributes: A maternal hill breed, the Welsh Hill Speckled Face is well adapted to harsh climates and extreme terrain, but will also do well on more lowland farms. Pure and crossbred lambs thrive in similar environments. Commercial desirability: The Welsh Hill Speckled Face Sheep Society promotes the females of the breed as quiet and careful mothers of lambs with vigour that are suitable for the food chain. Appearance: Of the many types of sheep referred to as a type of Welsh mountain, sheep specifically carrying the Welsh Mountain name are of moderate length and height with a broad forehead and muzzle. The face and legs are white or slightly tanned, with a black or speckled nose. The fleece is white and males can be horned. History: The breed was developed in the Welsh hills in the 13th century, being particularly prevalent in the hills of Glamorgan, Monmouthshire, Carmarthenshire and South Powys. 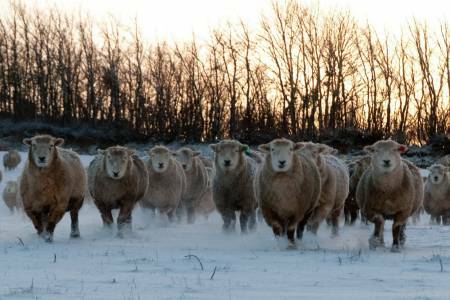 The Welsh Mountain Sheep Society (Hill Flock Section) looks after the breed within commercial settings, promoting the breed and a sustainable way of life in upland Wales. 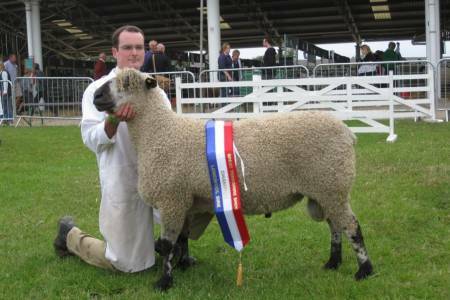 The Welsh Mountain Sheep Society (Pedigree Section) focuses on genetic improvement and showing the breed at various agricultural shows and events. Geography: Welsh Mountain sheep continue to be popular throughout Wales and the Border counties. Breed attributes: A maternal hill breed, the Welsh Mountain is economical and hardy with females that carry excellent mothering ability. They will thrive in extreme environments, finding grazing to look after themselves and their lambs. Commercial desirability: The Welsh Mountain Sheep Society (Hill Flock Section) promotes the versatility and survivability of the breed, saying it is unrivalled in its natural environment which includes some of the most difficult areas in Wales. 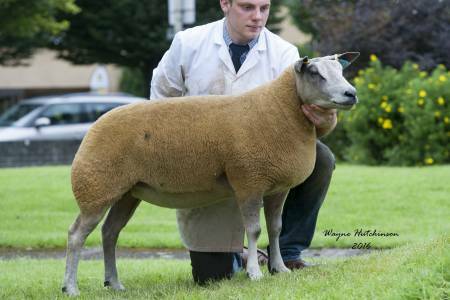 The Welsh Mountain Sheep Society (Pedigree Section) promotes the progress made by the breed in terms of maternal attributes of the females and carcase quality inherited from the males. Appearance: A medium sized sheep with a black and white mottled face and legs and a white fleece. The facial colouration varies depending upon breeding. History: As the name suggests, the Welsh Mule is a crossbred sheep. The father is always a Bluefaced Leicester and the mother a Welsh Mountain, Beulah or Welsh Hill Speckled Face. This cross was developed in the 20th century and the Welsh Mule recognised as a breed in its own right with a breed society in 1978. Geography: Welsh Mules are found throughout Wales and the UK. Breed attributes: The females of this breed combine the prolificacy and milkiness of their sire with the hardiness and longevity of their dam, making them sought-after mothers to be crossed with a terminal sire breed to produce lambs for the food chain. Commercial desirability: The Welsh Mule Sheep Breeders Association promotes the breed as for its mothering and foraging abilities, saying it is able to adapt to upland and lowland environments and a variety of management systems. 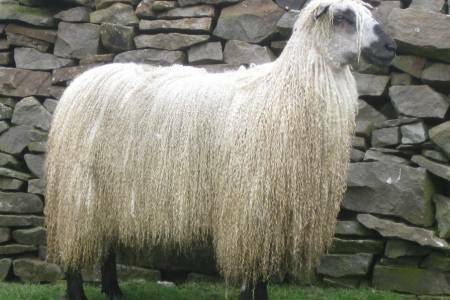 Appearance: A tall, long-woolled sheep, the Wensleydale has a blue head, ears and legs that are virtually indiscernible beneath its high quality, white fleece. There is a separate section in the breed register for black Wensleydales, which come in colours ranging from jet black through to a silver grey. 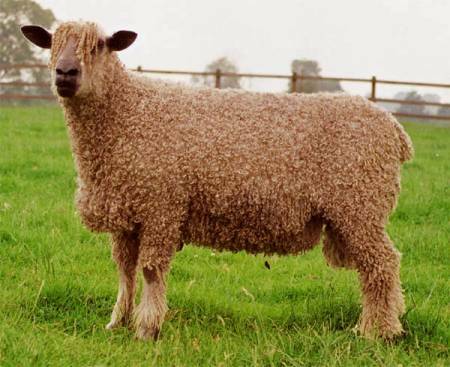 History: The breed was developed by crossing a now extinct local longwool breed from the region of the River Tees in Wensleydale, North Yorkshire with a specific Dishley Leicester ram named ‘Bluecap’. The first sire was born in 1839 and the Wensleydale Longwool Sheep Breeders Association established in 1890. Geography: Recognised as a rare breed, the Wensleydale continues to be mainly found in the north of England, but with specialist flocks in other parts of the UK. Breed attributes: A large, prolific sheep with a fine, long-stapled fleece, the Wensleydale is reasonably hardy and able to produce large lambs in a variety of conditions. 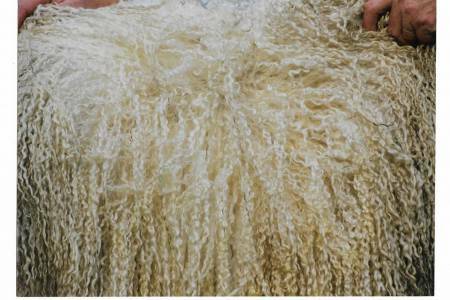 Commercial desirability: The Wensleydale Longwool Sheep Breeders Association promotes the combination of high quality wool and crossing potential, passing its prolificacy, milkiness and hardiness to breeding females. 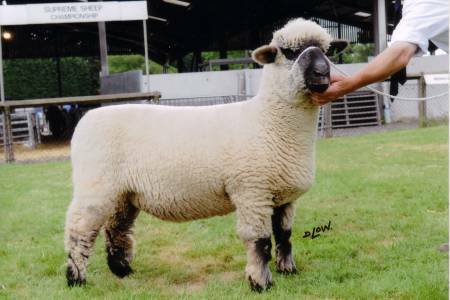 Appearance: As well as the white face suggested in the breed’s name, the Whiteface Dartmoor also has white legs and a white fleece with a fairly strong curl within it. Males have spiralled horns and ewes are polled (hornless). History: Claimed to be one of the UK’s oldest breeds, the Whiteface Dartmoor as we would recognise it today descended from the heath sheep of South West England in the 17th and 18th centuries. 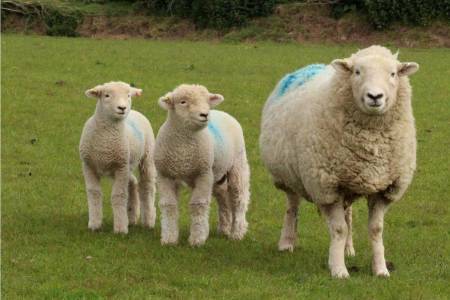 The Whiteface Dartmoor Sheep Breeders Association was established in 1950 and, in line with its status as a rare breed, works to preserve genetics for the future. Geography: Originally spread over the West Country of England, the majority are now settled on Dartmoor, Devon. 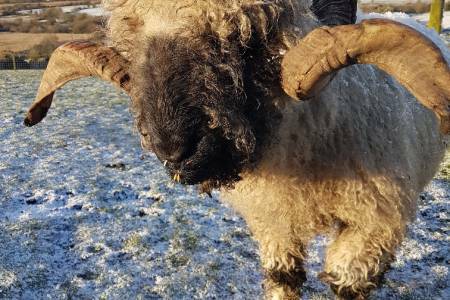 Breed attributes: Originating on coarse heathland and the changeable climactic conditions of Dartmoor, Whiteface Dartmoor sheep are hardy and able to survive on poor grazing with little supplementary feeding. 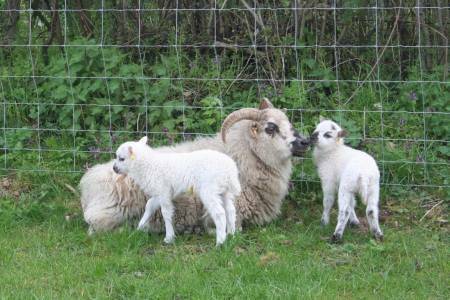 Commercial desirability: The Whiteface Dartmoor Sheep Breeders Association promotes the females as excellent mothers that are hardy and long-lived, producing small but lively lambs. 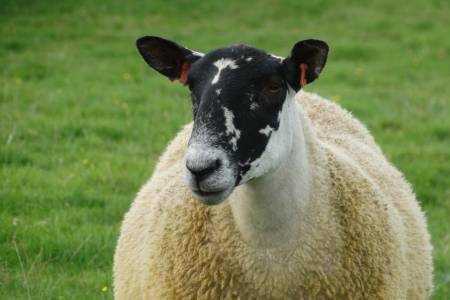 Appearance: While the white face suggested in the breed’s name is usually the case, Whiteface Woodland sheep can also have some speckling on their skin. However, the reasonably high quality fleece is always white. Both genders are strong-boned and horned. History: The breed originated from the black faced Linton type of mountain sheep once found in Northern England, which means it would have been related to the Swaledale and Lonk at some point in its history. The Cheviot and the Merino were used in the breed’s development in the 17th century and the Whitefaced Woodland Sheep Society was established in 1986. 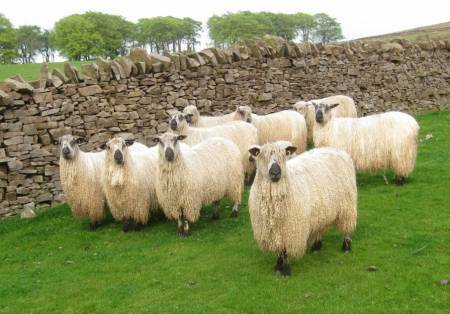 Geography: Having originated in the Pennines and Peak District, on the borders of Derbyshire and Yorkshire in England, this rare breed continues to be mainly found in specialist flocks in this area. 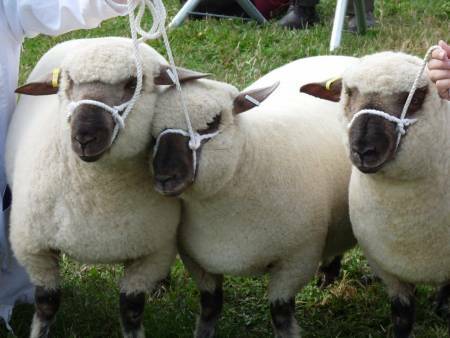 Breed attributes: Bred as a hardy, upland breed, the Whitefaced Woodland is larger than many hill breeds and produces lively, strong lambs reared by hardy, milky mothers. Commercial desirability: The Whitefaced Woodland Sheep Society promotes the breed as good looking sheep that enhance any environment and adapt well to all conditions and systems of management. Appearance: A large, long legged breed, the Wiltshire Horn has a white face and legs. What little wool it has is naturally shed each summer. Both sexes are horned. History: The Wiltshire Horn is thought to be descended from the original sheep brought over in the Roman invasion of the UK. 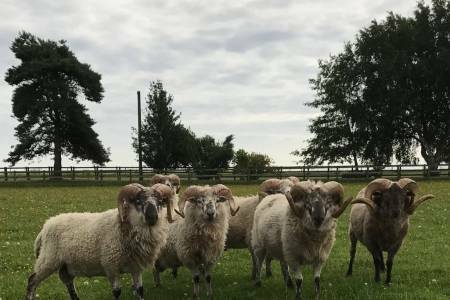 The lack of wool that saw the breed fall out of favour when the UK economy was reliant on wool, now means Wiltshire Horns are popular for the easy care characteristic of not requiring shearing. Wool shedding has meant it was also exported from the UK to hot climates such as Australia and the Caribbean. Geography: Having remained local to its origins in Wiltshire, Southern England, recent years have seen the Wiltshire Horn spread to other parts of the UK for crossing work to develop wool shedding composite breeds. 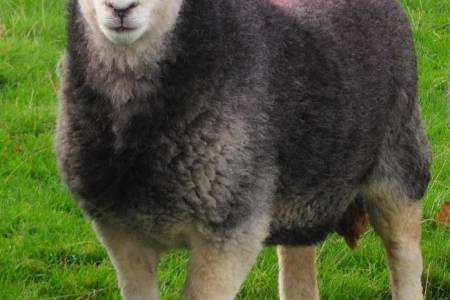 Breed attributes: Despite not having the thick fleece familiarly seen on UK sheep breeds, the Wiltshire Horn is a relatively hardy lowland breed with easy lambing and good mothering traits. 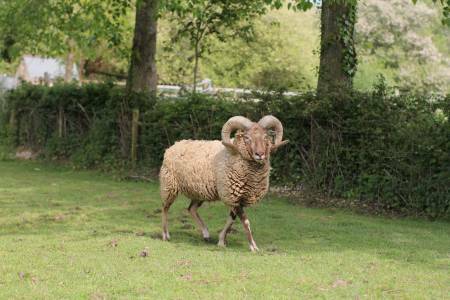 Commercial desirability: The Wiltshire Horn Sheep Society promotes the breed as low input and economical, because of its ability to shed its wool and other easy management traits. Lambs have a good carcase shape and weight for the food chain. The Zwartbles' name means Black with a White Blaze. She is a tall, long-bodied sheep which always carries her head up high, with alert ears. Ideally she should have an all black body and black head with a white blaze from the top of the head to the nose, two white socks on the rear legs and a white tip to her tail. Two white socks on the front legs are also very desirable. Both rams and ewes are naturally polled. The fleece is of remarkable quality and texture shading from black to brown. Average mature ewe weighs 85kg, rams 100kg.